During our trip we have tried to visit the capital of each county, despite sometimes hearing mixed reviews about a few of them. 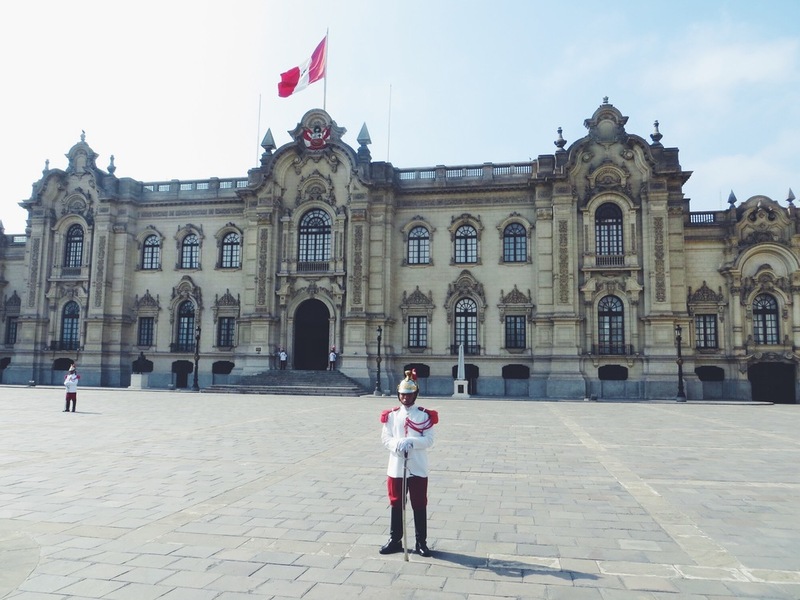 Lima was no exception, and being the largest city in Peru (with a population of over 8 million) we were curious to see what the capital had to offer. 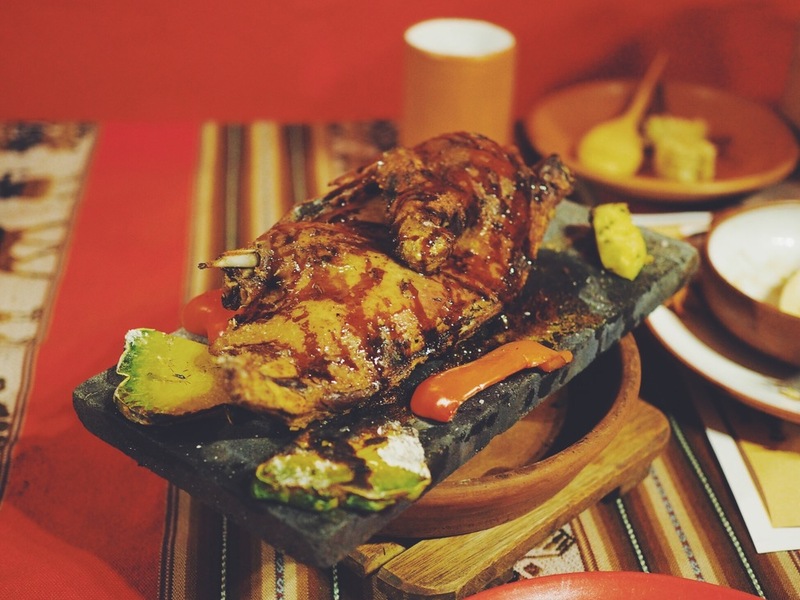 We had heard that the food was second to none, and being home to some of the world's best restaurants we couldn't pass up the opportunity to sample some of the best Peruvian cuisine. Good food also comes at a cost, so we decided to spend just a couple of days there so we didn't end up blowing our budget! From Huacachina we got an early bus northbound along the coastline for around 4 hours before arriving in the main bus terminal at mid day. 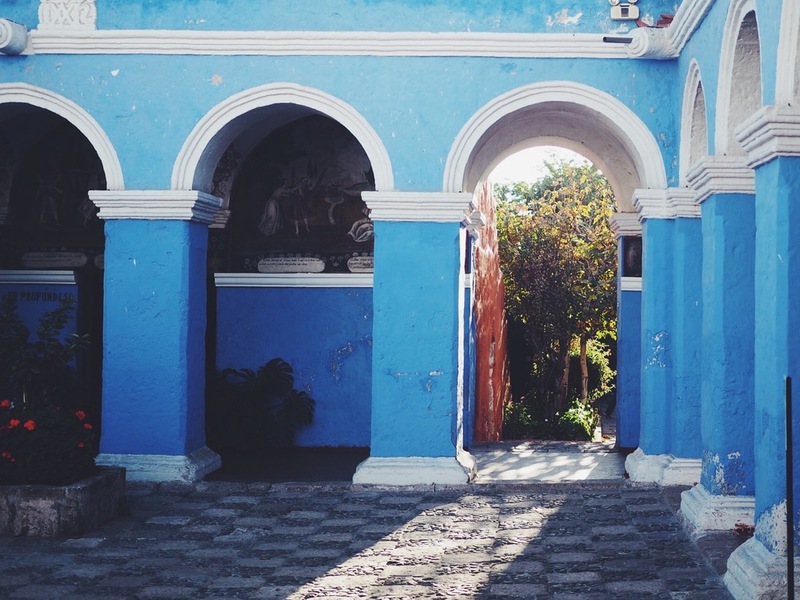 We found that one of the best areas to stay was Milaflores, a barrio on the south side of the city close to the coast. We checked into Family Backpackers Club hostel, a pink town house with quirky interior but a rather quite vibe. We dropped our stuff and headed out for lunch, keen to try some world-renowned sea food. Nearby was the well reviewed Costazul, a small pub-like seafood restaurant that seemed like the perfect place. We ordered seafood saltado and seafood pasta, which were both fresh and delicious, and a great welcome to the city of Lima. Life on the move isn't always as exciting, and being the first big city we'd arrived at in quite a few months we decided our first afternoon should be spent doing admin. This included a much needed visit to the hair dressers (it had been around 5 months and Joe's hair was turning into dreadlocks). They did a really good job, and luckily didn't end up with a mullet that was a high risk in Bolivia and Argentina. As Stef had half an hour to kill, it only seemed fair that she got her nails pedicured and painted ready for the beach whilst waiting! On our first evening we researched a few places to eat, and came across Panchita, a restaurant located in the Milaflores district. The restaurant is famous for generous servings of grilled meat and fish and a bustling atmosphere. We arrived at 7.30pm and got some Pisco Sours in the bar area whilst waiting for our table. The restaurant was pretty big, with many tightly packed tables, but the waiters were still very attentive and personal. We ordered a ceviche starter to share, which was fantastic with beautiful chunks of perfect seasoned fish and corn sides. For mains we had the swordfish skewers with Andean vegetables and the Soupa de Langostinos that came in a huge bowl with generous servings of large shrimp. It was a fantastic meal and the food and service was just what we'd hoped for in Lima. 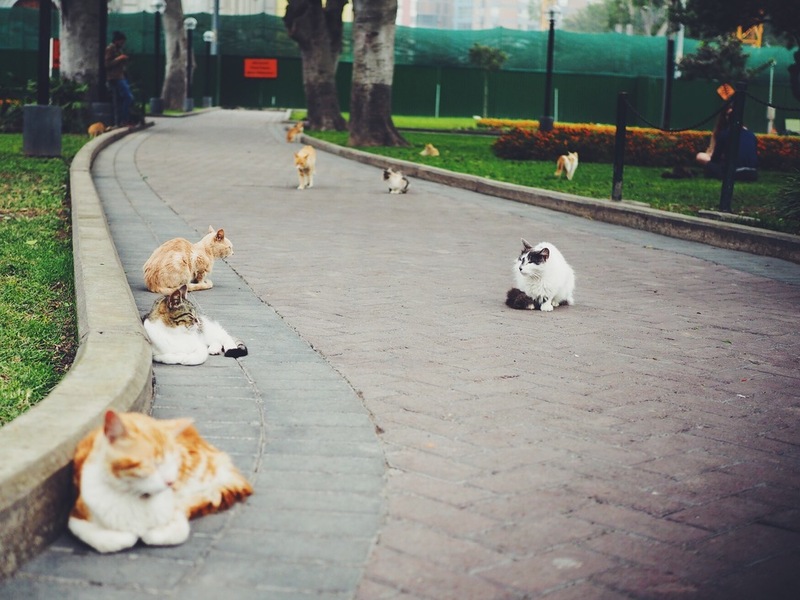 The next day was set aside for sight seeing around Lima, and we decided to visit Parque Kennedy in Milaflores, a small but pretty park known for its many resident cats that had claimed the area. It was quite strange seeing so many cats roaming around the park, but they seemed very relaxed there, and the locals didn't seem to mind, with many of them sat contently petting them. As with most cities we've visited on our travels we decided to take the free walking tour. We met with other members of the group and headed to La Cachina bar to get a free craft ale to kick off the tour. We were all given name badges, which was a bit dorky but helpful to get to know the others quicker. 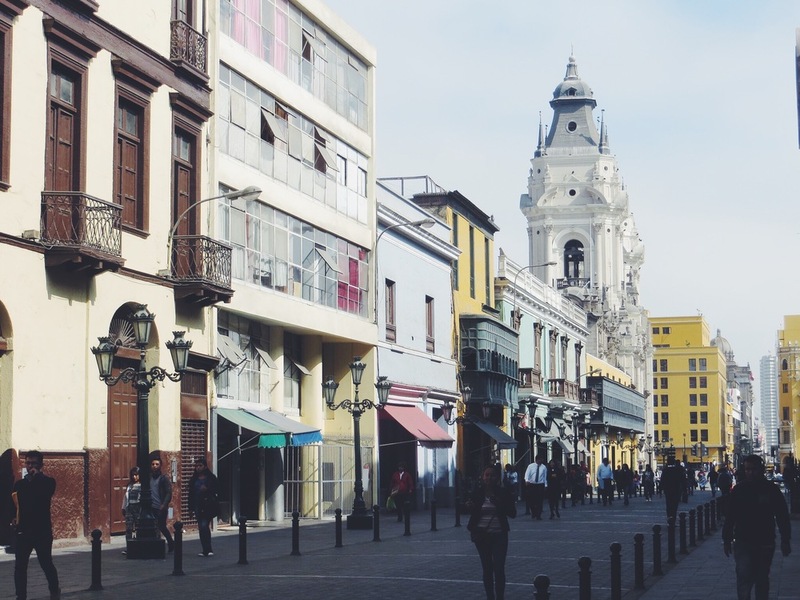 After the bar we all jumped on the local bus and headed to the Plaza Mayor de Lima in the historic centre. 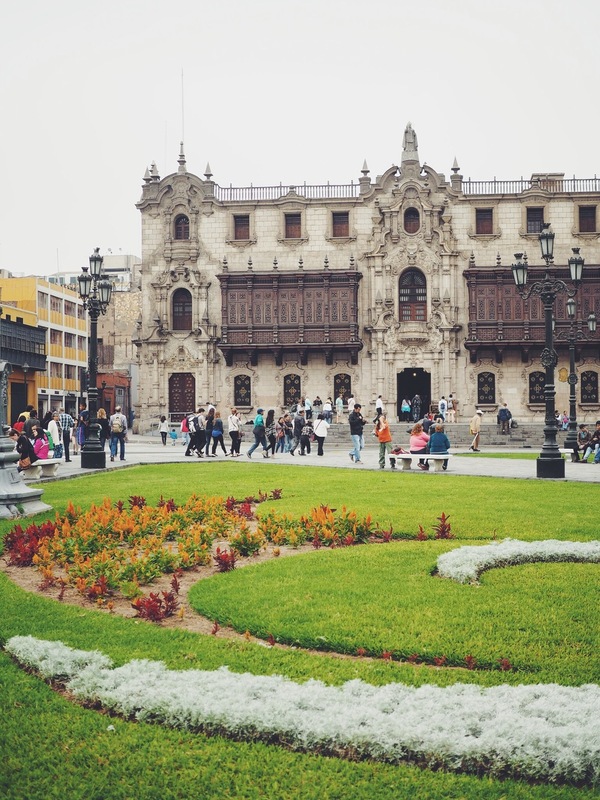 In the plaza were many beautiful buildings including the Cathedral de Lima and the Government Palace of Peru. As it was a Saturday we were able to catch the changing of the guards in the palace, which had drawn a pretty big crowd of locals and tourists alike. After the main square we walked to the Monastery of San Francisco where our guide gave us a brief history of Lima, including the conquest of the Incas by the Spanish. He also explained how the architecture had been destroyed by heavy earthquakes, meaning many of the buildings had been rebuilt 2, or even 3 times. After a quick snack break (where we took advantage of the fresh churros!) 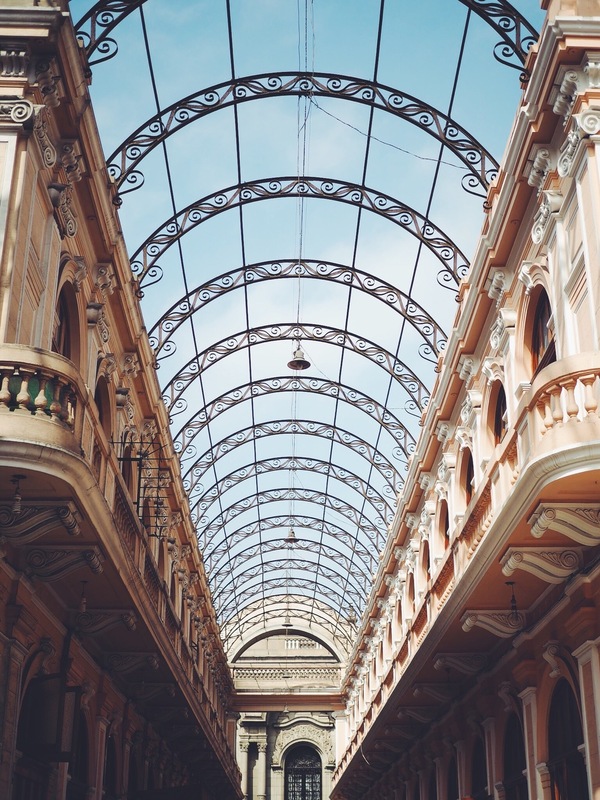 we headed to a beautiful old railway station with a glass ceiling and intricate metal arches. Our guide explained that it is now used as a royal post office. The tour was concluded in the central market, where we sat down and were told about the various types of Pisco, a brandy made from distilled grape wine, including Puro (pure), Acholado (blend), and Maracuja (passion fruit) Pisco. We got to sample each one, some being more pleasant than the others, but it was a nice gesture from our guide and interesting to sample the different types. Overall the tour wasn't quite as interesting as other cities we had visited, but the effort the guide made was very apparent, and we still got to see a few sights we otherwise would have missed by ourselves. 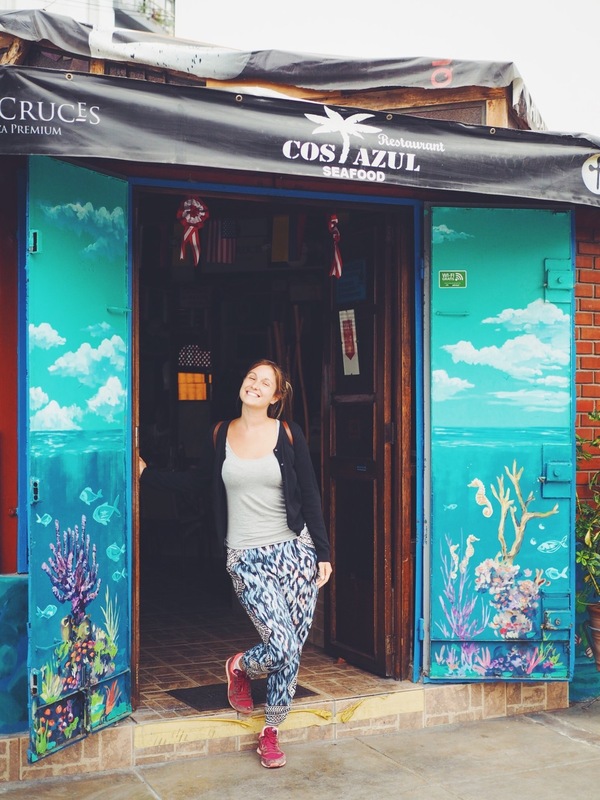 After our tour we headed to the Barranco district and wandered around the boutique shops and quaint cafes. That evening we met up with Daniel and Amanda, an Australian couple we'd met a few times before in Peru who are doing a similar trip (you can follow their great blog here) and headed for some dinner. 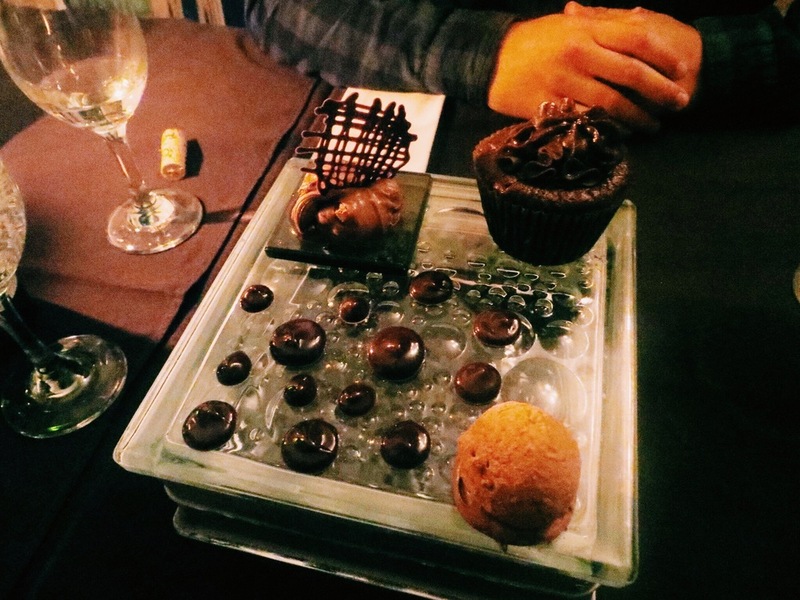 As we were in the city of world-class food we wanted to treat ourselves and so headed to La Locanda, a restaurant situated inside the Swissotel in the San Isodro neighbourhood with great reviews. On entry we noticed the restaurant was pretty fancy, and felt a bit under dressed, but the waiters seemed friendly and quickly sat us down at our table. We decided to share two starters, grilled octopus and ceviche, which were both delicious. For main course we ordered the short rib cannelloni (recommended by the waiter) and the pork shoulder with vegetable risotto. The presentation was amazing, and the flavours didn't disappoint. 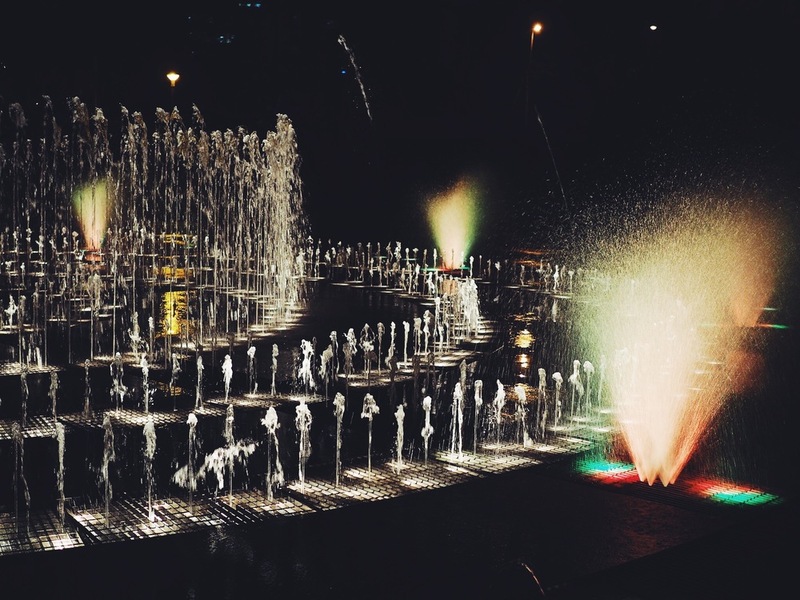 After our fantastic meal we headed to the Parque de Reserva, a centrally located park with many water fountains, and we haggled down a taxi as much as we could and made our way there in a hurry before it shut. We thought it closed at 9pm, but on arrival we realised we had an extra hour which made it a lot less stressful. 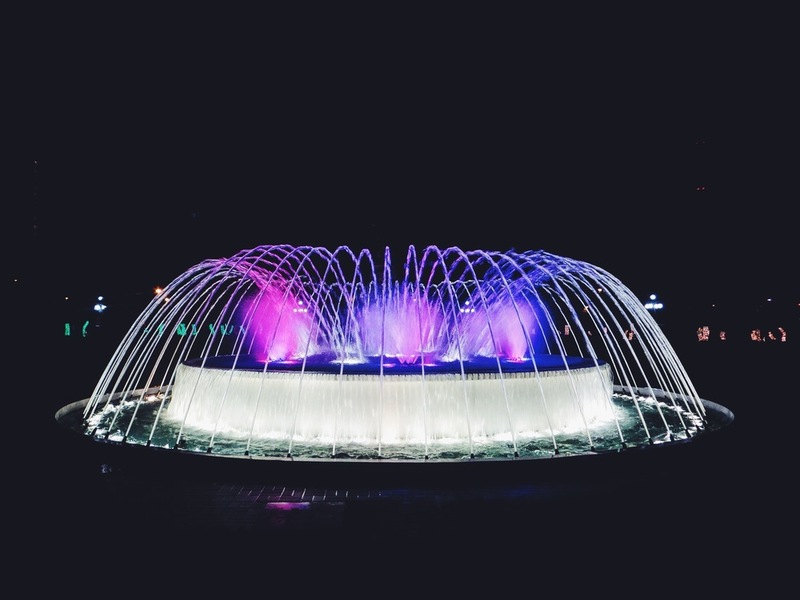 After paying 10 soles each we walked through the entrance and were met with an amazing 40 meter high illuminated water fountain with classical music playing around us. As it was late we pretty much had the place to ourselves, and spent a fun hour waking around the various colorful fountains. Some of them were interactive, including a timed fountain that you could walk inside of, and one that even arched right over you to create a tunnel. It was a great way to end our short time in Lima. On our final morning we had booked a bus to Mancora at 2pm, and so headed for a breakfast in the nearby Buenavista cafe for a great view of the ocean. We wandered through the Parque Isaac Raban to the cafe perched on the hilltop overlooking the sea. 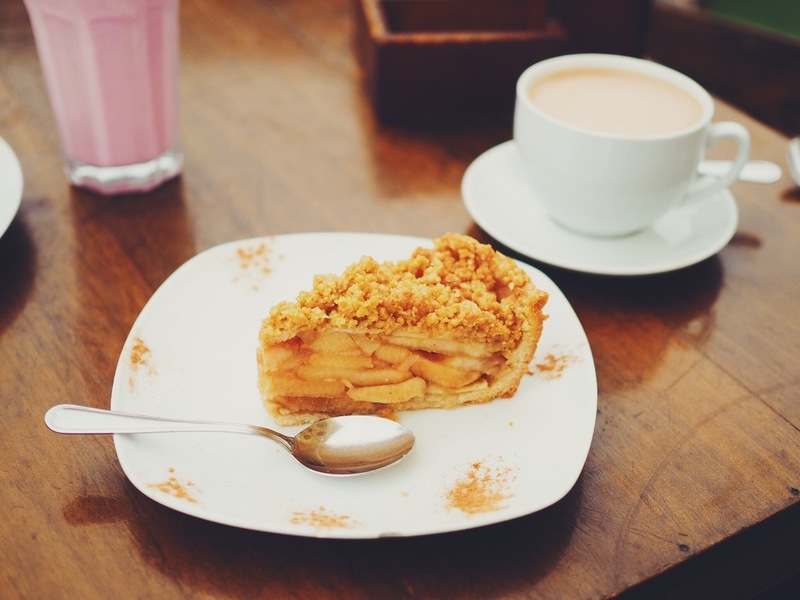 We ordered apple pie, corn bread and hot chocolate and relaxed and watched the surfers in the distance before our long 18 hour bus journey to the northern beaches of Peru. 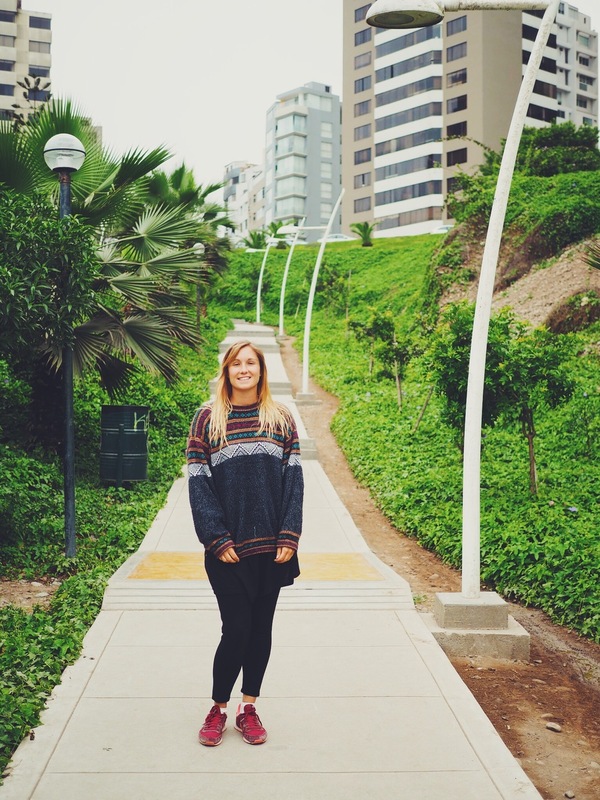 For us, Lima was never a key stop-of during our trip, and although short, we felt 48 hours was enough to fit in everything we wanted to do. The food was by far the highlight of our visit, and definitely the best we'd had in South America, making it worth the trip for that alone. 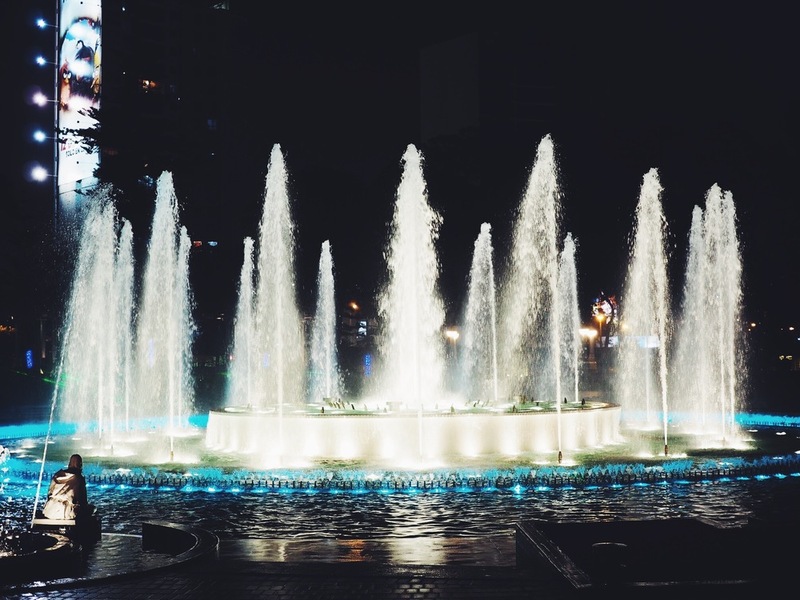 Seeing the water fountains at night was a nice bonus for us, and it was nice to enjoy an evening with friends we had made on our travels. We were glad we stayed in Milaflores, as it was a nice and safe area, but the city just didn't to have the vibrancy or interest of Buenos Aires or Cusco, and so we didn't feel too bad that our visit was short but sweet. 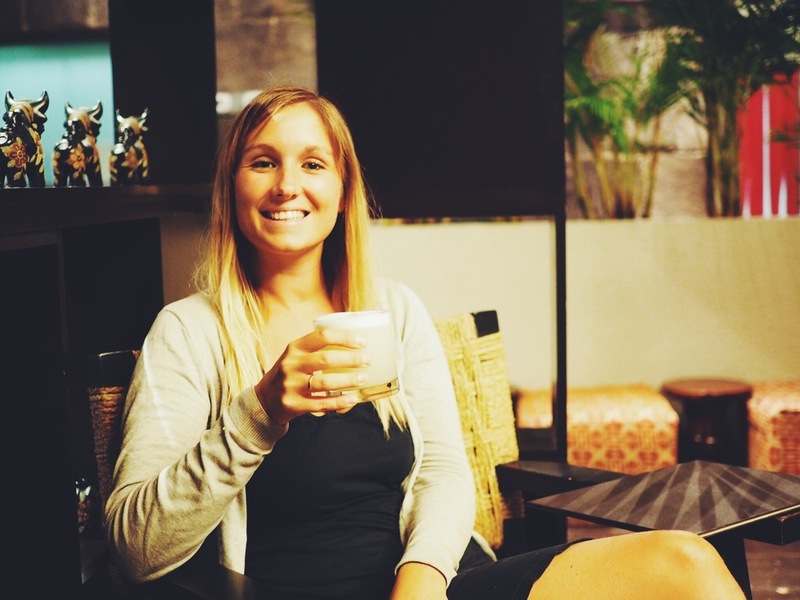 Before heading to the much anticipated Galápagos Islands we needed some time to research the different options for cruises, diving and day trips, as well as work out a budget to keep our expenses minimal. 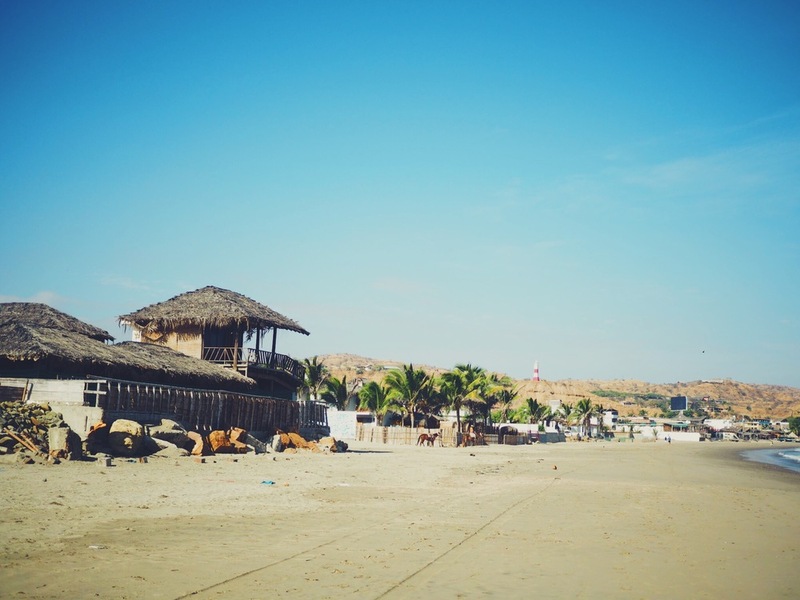 To do this, we wanted to stop off in a place not too far from Guayaquil airport, and Mancora, a relaxed surf town in the north west coast of Peru, seemed like the perfect choice. 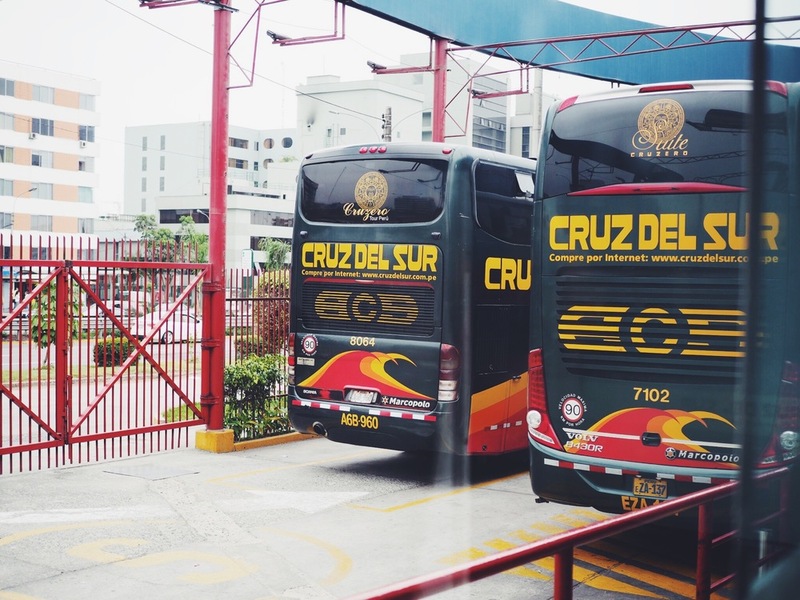 We got a comfortable overnight bus (Cruz del Sur) from Lima that took 21 hours, and arrived at the small, slightly run down town just before lunch. 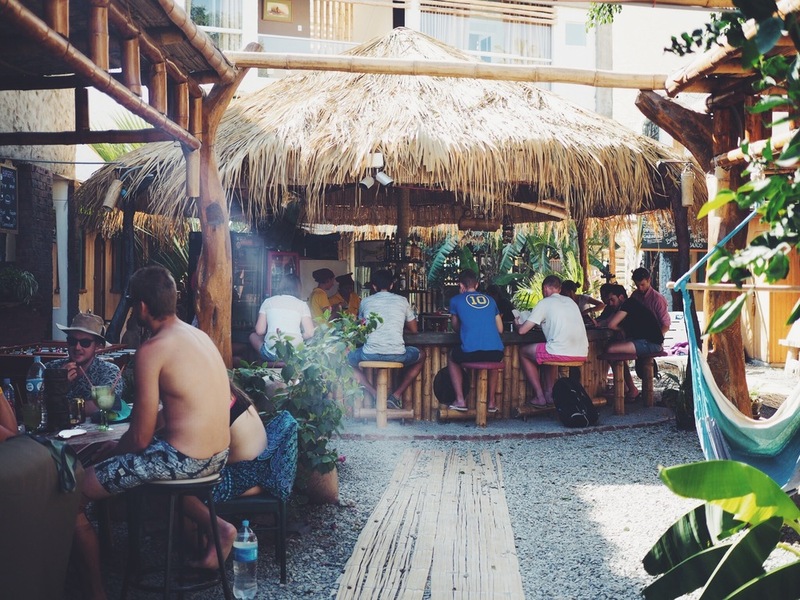 We checked into Laguna Surf Camp, a hostel located a stones throw from the beach, and complete with grass huts, hammocks and a small pool. It was the perfect stop-off for which to do our research. The only downside of the hostel was the absence of the owners, who didn't seem to be around at all for advice or help on what to do in the area. This didn't matter too much as luckily there was wifi so we could crack on with our research for the Galapagos. The following day we took a break from research and headed to the beach. We stopped off at Green Eggs and Ham for breakfast, a wooden clad house in the beach serving excellent breakfast options. We then strolled down to the left side of the beach away from any crowds and sunbathed and swam for a few hours. That evening we headed to Aqua for food. It was one of the best restaurants in Mancora, although due to the size of the town we weren't expecting anything amazing. On arrival the place was full, and we sat down and ordered some cocktails while we decided what to have. We ordered the tempura prawn starter followed by the seafood curry, which were both really tasty! It was a nice surprise to have such great food in an otherwise fairly basic town. The following day we took a bus with CIFA to Guayaquil where we were to get our flight to the Galápagos Islands! After an incredible trek in the Colca Canyon, we continued our travels in Peru northbound towards Huacachina, a small desert oasis just outside the city of Ica. 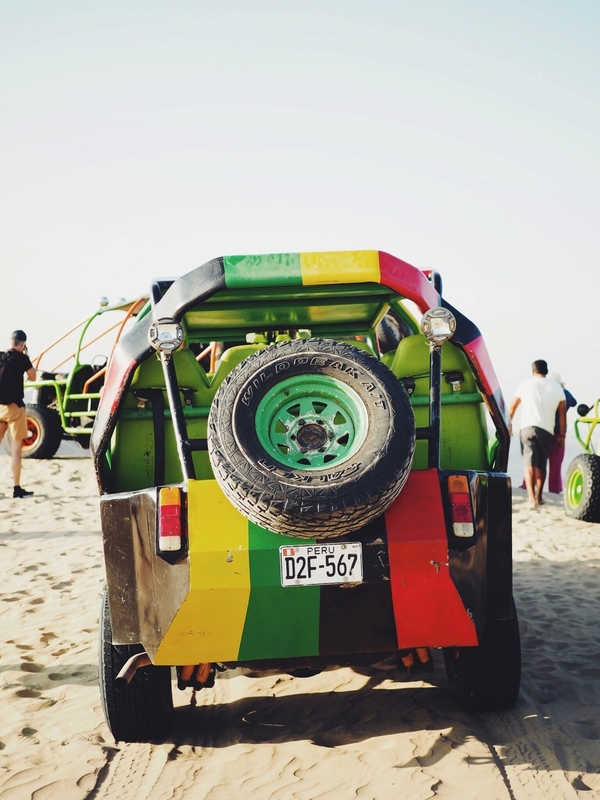 Huacachina is famous for its huge golden sand dunes, and is therefore a popular place to do sand boarding and dune buggy tours in the surrounding desert. To get there we took a night bus from Arequipa, with a short wait at Nazcar (which we decided to skip) before continuing up through Peru passing small dusty towns and dry, rocky landscapes. 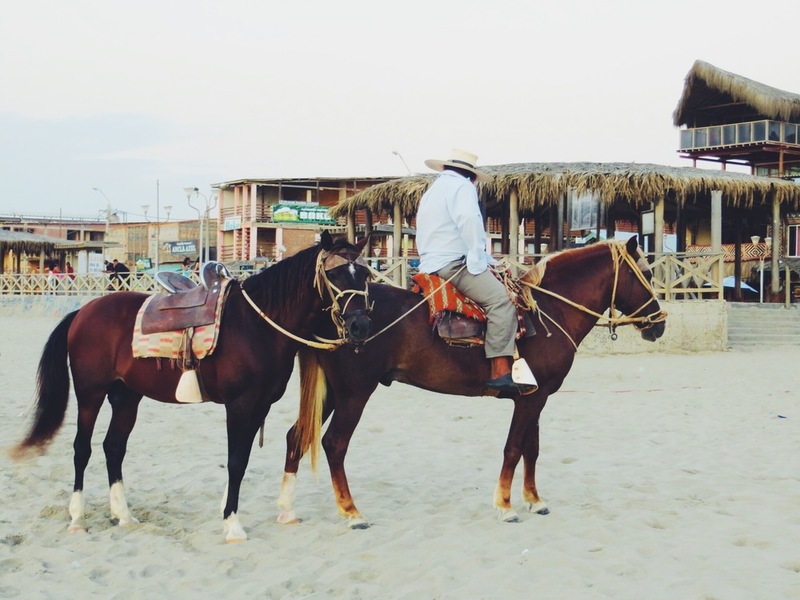 After arriving in the connecting city of Ica we took a short cab ride to Huacachina in time for a late breakfast. After doing a bit of research on Huacachina, and with relatively few options available, the best choice for accommodation in the area was Bananas Hostel, a lively place complete with a pool (which was surprisingly cold!) and a very social circular bar/restaurant serving a selection of decent western food and cocktails. 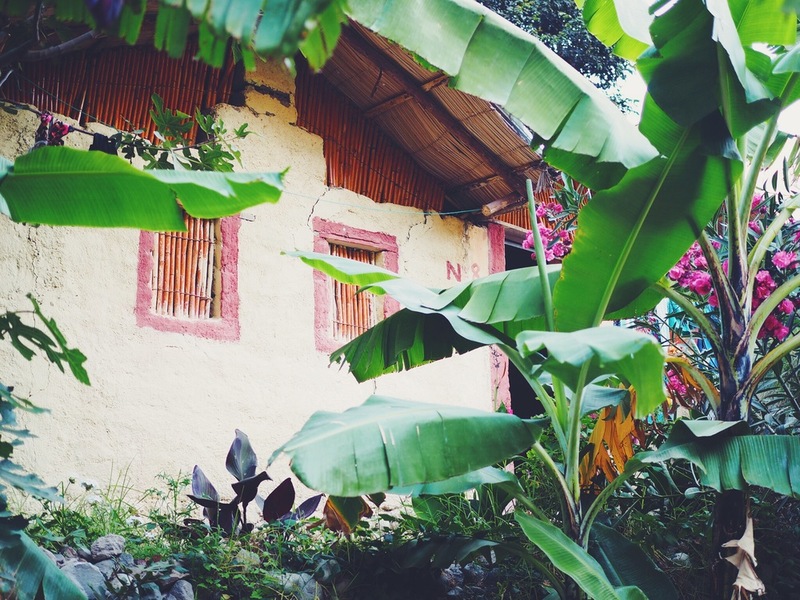 The rooms were built from bamboo and reeds, and the sand and pebble floor around the hostel completed the beach vibe. 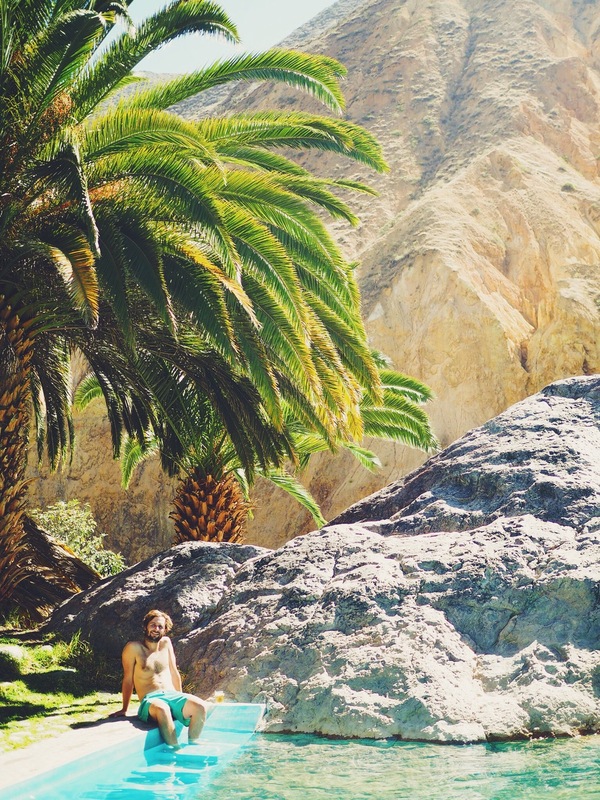 It was a great place to chill, soak up some desert sun and chat to other travellers en route through Peru. After arriving we decided to wander through the town, which is situated around a small central lake padded with grasses and reeds. 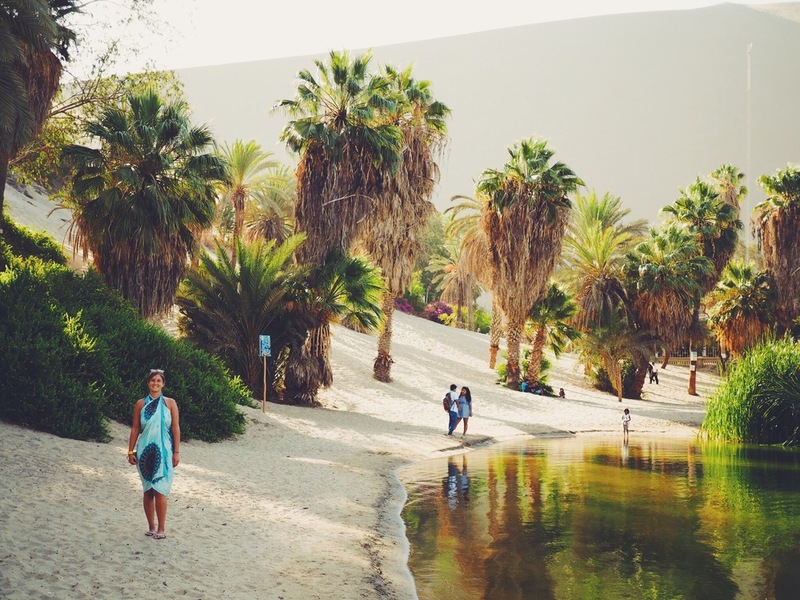 Even though the lake wasn't suitable for swimming, the enormous surrounding dunes made for a very dramatic backdrop; it looked exactly how you'd imagine a desert oasis to be! We wandered around the lake and down a few streets in the town to check it out, but found our hostel actually had the best food and a more lively atmosphere. Another perk of staying at the hostel is that an activity or meal is included in the (seemingly expensive) price. On the first night we opted for the BBQ, which was a delicious combo of chicken wings, steak and sausages with salad and veg. It was a great opportunity to meet other travellers and chat about their experiences, and get tips on our upcoming destinations. That night we booked onto the dune buggy tour for the following day, and settled in for a few beers around the bar. 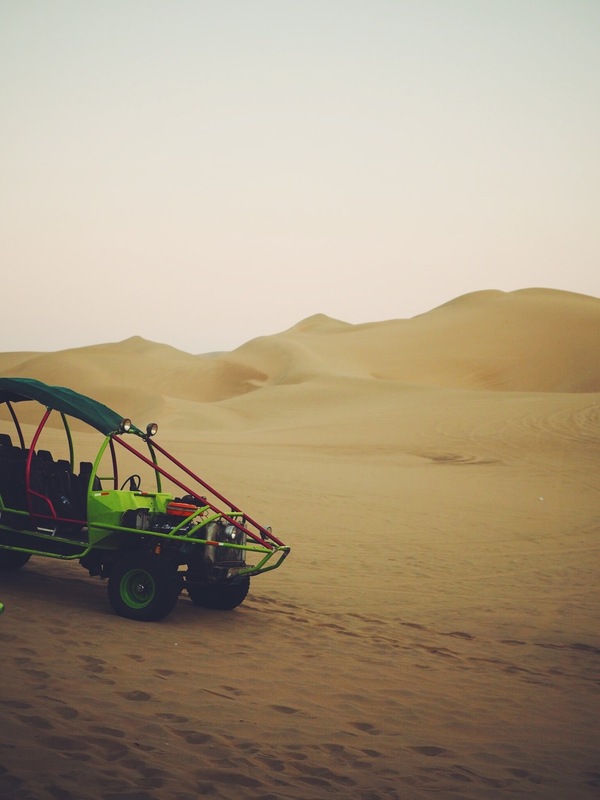 On our second day we prepared for our buggy tour through the massive sand dunes surrounding the oasis. The tour didn't started until 4pm, and so we managed to get some relaxing pool time in, and by the time we were due to leave luckily the desert heat had subsided. We hopped onto the reinforced steel buggy parked outside our hostel with about 8 others, and strapped in using the heavy duty seat belts. The driver slowly eased through the town in a convoy of other buggies until we reached the entrance to the dunes. From that point on things got a lot more intense, and as we climbed up the first mountainous dune we realised we were in for an exciting ride. We hit the peak of the first ridge and plummeted down the steep sand dune at speed, evoking shrieks from ourselves and the fellow passengers (and much to the drivers amusement!). As we continued we began to pick up even more speed, and flew over small and large humps, down steep dips and even got some air over the sharper ramps - it was a lot of fun! We then stopped at the top of a large sand dune and got some pictures of the incredible desert surroundings that stretched for miles, with orange and pink tones created by the setting sun. The driver then began to unload the sand boards from the back of the buggy, and after waxing them up we attempted our first descent. We were a little rusty during the first couple of goes, but after persevering (and a few very sandy tumbles!) we started to get the hang of it, and Stefs snowboarding skills came into their own! After the first dune we were met with two more, the last one being even higher and steeper that the previous two. At this point most people decided to go down on their stomachs, getting huge amounts of speed down the steep dune. This was actually equally as fun, and allowed you to gain even more speed. Some people dug their legs into the sand to slow down, where as others ripped down as fast as they could with zero friction, covering a good 30 meters past the slope before stopping. Once we had complete all 3 dunes we got back into the buggy and made our way through more gentle sandy mountains with the sun setting in the distance. 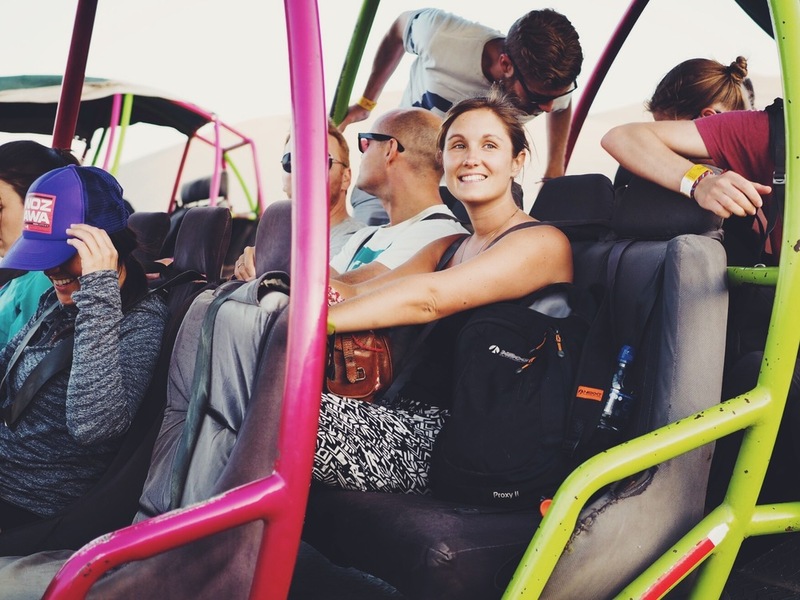 We parked up with a load of other buggies to see the sunset view of Huacachina and the lake from above, with the city lights of Ica in the distance. We found the town looked much more appealing from above, and with the surrounding scenery and setting sun, it was a picturesque way to end the tour. As it got dark we slowly convoyed back to the town and to our hostel, feeling very sandy but also very satisfied with the days activities. 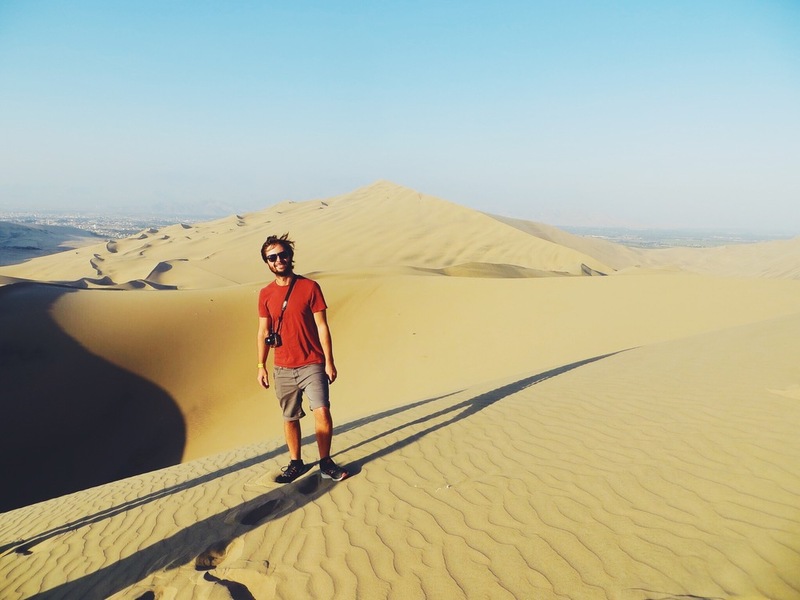 Having 3 days in Huacachina felt like more than enough time to both relax and take advantage of the sand boarding and buggy tours that make the place so popular. Although the town lacked culture and soul, the activities on offer more than made up for it, and we found it to be a great stop-off for any backpacker who enjoys a bit of sand, sun and excitement. Bananas Hostel was perfect base to chill for a few days, and having been to many culture-rich places in Peru during the past month we didn't feel too guilty about the gringo-heavy scene and western food. We took another long bus up the north-west coast of Peru, excited to have Ecuador and the Galápagos Islands closely in our sights. After exploring both Machu Picchu and the Peruvian jungle, the next natural step for our travels took us to Arequipa, about 500km south of Cusco. 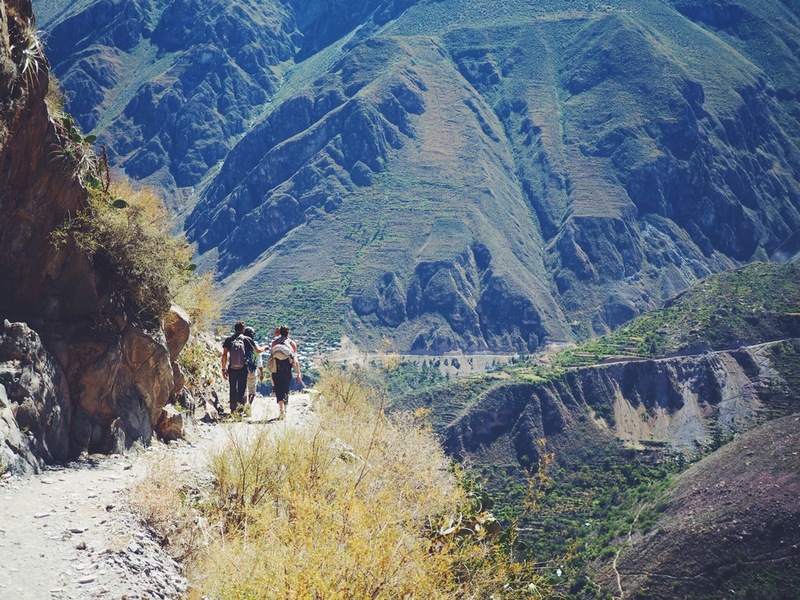 One of the main reasons to visit Arequipa is to trek the Colca Canyon, the second deepest canyon in the world and a great place to spot giant Andean condors. Arequipa itself is known for it's beautiful white volcanic-stone architecture, so we were excited to spend a few days there before our trek. 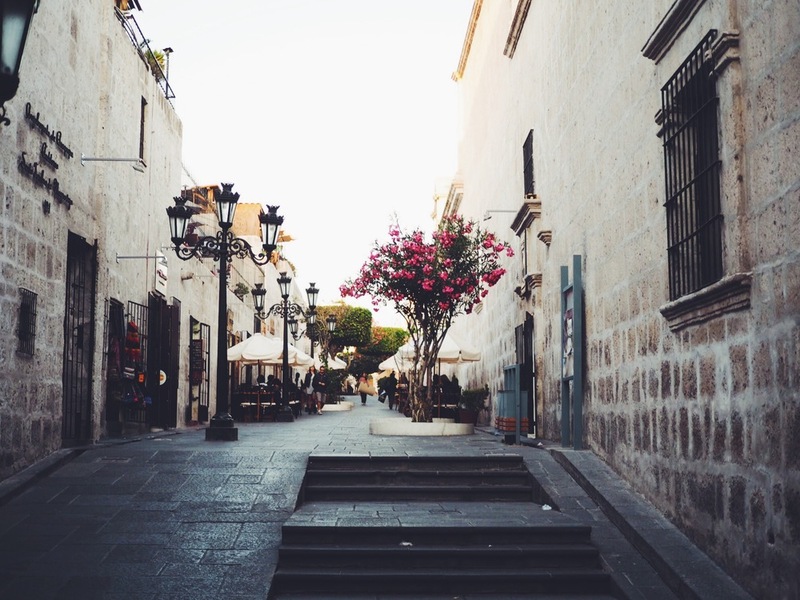 Being the second largest city in Peru, we were surprised to find that the city centre of Arequipa was quite peaceful, with many small streets leading to beautiful old buildings and not too much traffic. 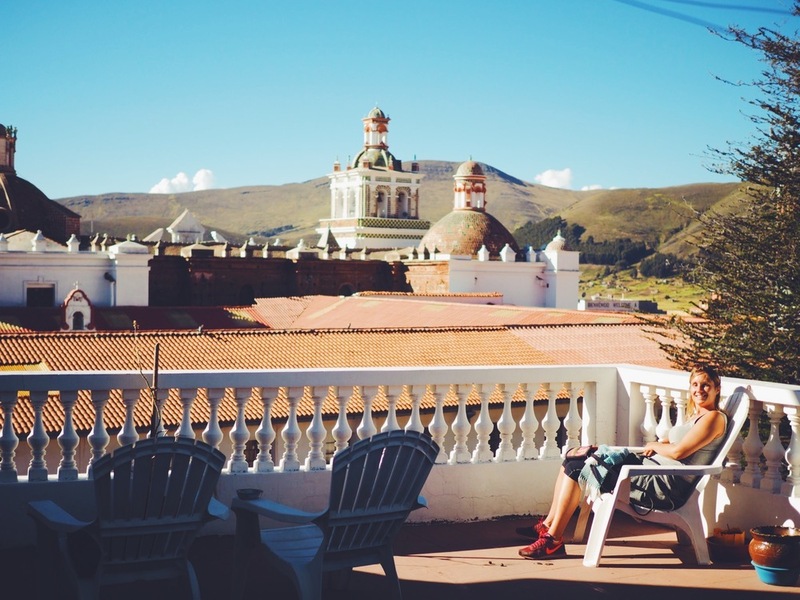 We had arrived by night bus from Cusco which had taken around 10 hours, and after a busy week were feeling pretty tired, so we checked into a reasonably priced hostel (La Posada Del Kuraka) and crashed. The hostel had a great roof terrace giving a great view of the city and the perfectly cone-shaped volcano Misti in the distance. 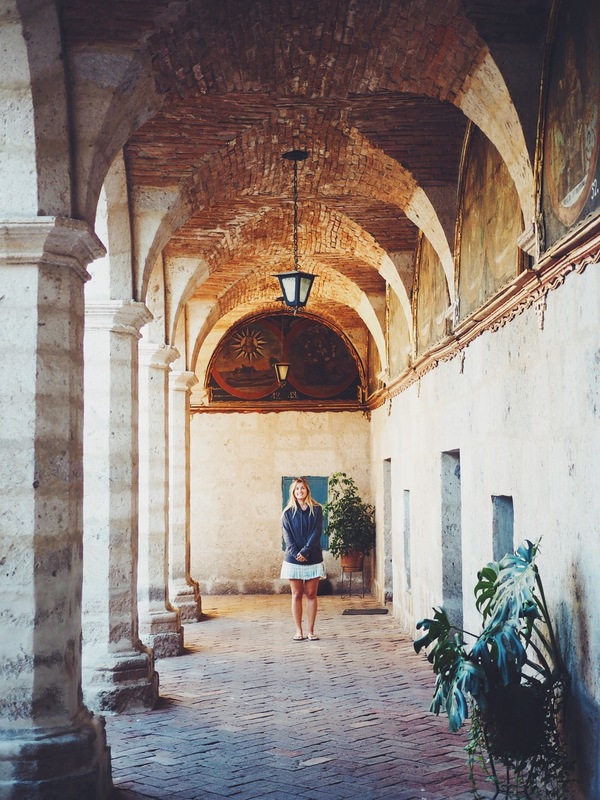 On our first day we took a walk through the Plaza San Fransisco to the pretty main square Plaza de Armes, taking in the white stone architecture such as the Basilica Catedral church and the many arches surrounding the square. As the sun was shining, we decided to grab an ice cream and found a bench to people-watch in the square. We then spent an hour or two wandering around the beautiful cobbled streets, peering into textile shops and exploring the quiet alleyways of the historic centre. After watching the sunset from our rooftop we noticed that the Basilica Cathedral was beautifully lit, so we headed to the square once more for a closer look. At night it was just as busy as it was in the day, and there was even a classical music concert drawing in a small crowd. For dinner we went to Hatunpa, where they served dishes with varieties of Andean potatoes as the main ingredient with a choice of toppings. It was cheap and the service was excellent, and we even got to sample some Peruvian craft ales. 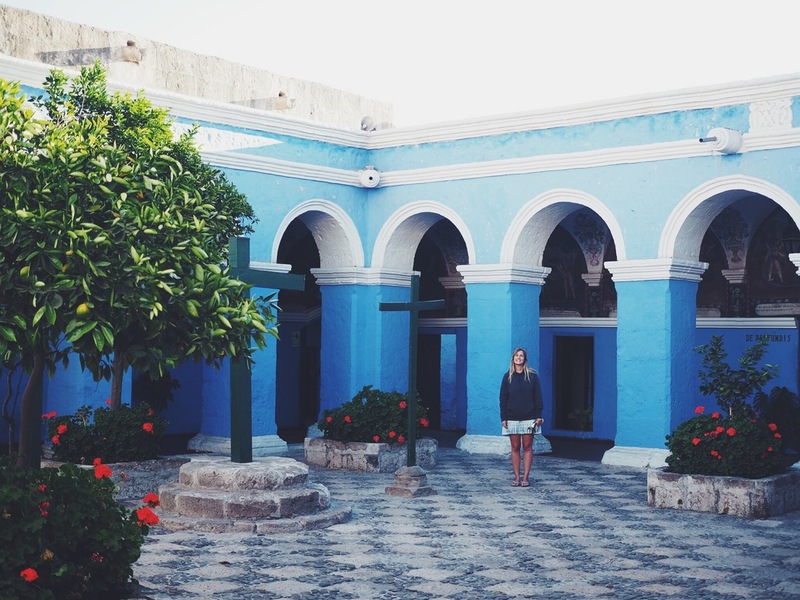 On our last day we had a lazy morning, and after lunch decided to go to the Monasterio de Santa Catalina, an old yet still functioning 20,000 square-meter monastery for nuns in Arequipa. We had to pay a rather steep 40 soles each for entry, but as its quite a big place we were told it was worth the money. On entrance we were greeted with a beautiful courtyard with many painted arches, plants and intricate tiles. 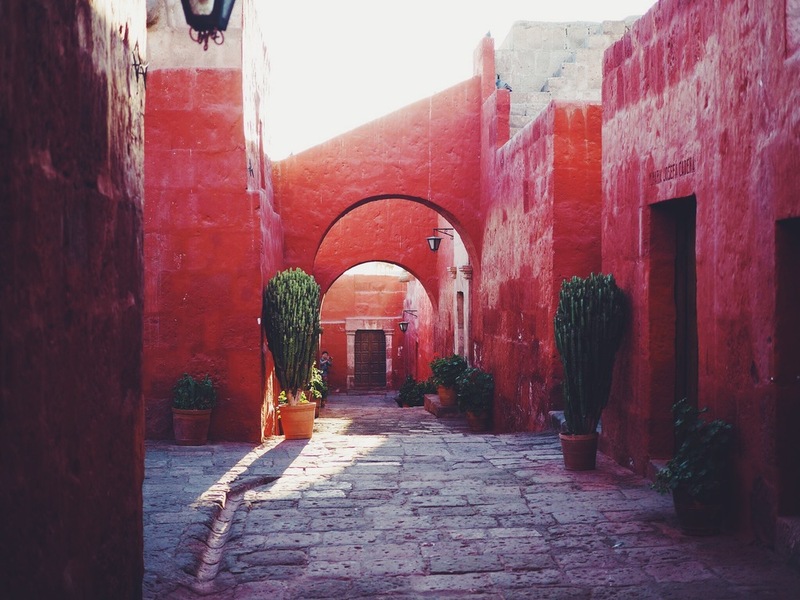 As we wandered through the maze of passageways it started to feel like we'd wondered back in time, and we really enjoyed exploring the Mudejar-style architecture, with walls painted red, blue and orange to define the various sections. It felt more like a small town than a monastery! The monastery was comprised of many rooms including kitchens, bedrooms, prayer rooms and chapels, all surrounded by very well kept gardens and water fountains. It seemed surprisingly quaint and comfortable considering nuns lived there, and was quite unusual compared to typically minimal religions dwellings. After an hour or so the monastery was about to close, and so we headed back to the hostel just in time to watch the sun set from our hostel roof terrace, having really enjoyed Santa Catalinas rustic charm and tranquil ambiance. We had been recommended Sonccollay on our travels, a restaurant in Arequipa that was known for it’s ‘pre-inca’ cuisine, an ancient style of cooking that used no oil or butter to prepare traditional andean ingredients. Curious by this, we decided to pay it a visit while we were there. The restaurant was situated on the main square overlooking the cathedral, and we arrived with high expectations and empty stomachs. On entering, we noticed that the restaurant actually wasn’t that busy, with only a few other people there. We sat outside (which was a little chilly), and ordered our food. The menu was surprisingly pricey, but we assumed it would be worth it once it came. To our disappointment we ended up waiting for over an hour for the food, with one dish arriving 20 minutes before the other. On top of this portions were less than generous, and we were a bit annoyed to leave feeling hungry, despite it being the most expensive meal we'd had in Peru so far. On the plus side, the food was really tasty, and the charcoal-grilled duck was beautifully cooked, as was the river lobster ceviche cured in passionfruit. It was also nice to meet the chef and see his rustic kitchen and traditional cooking techniques. 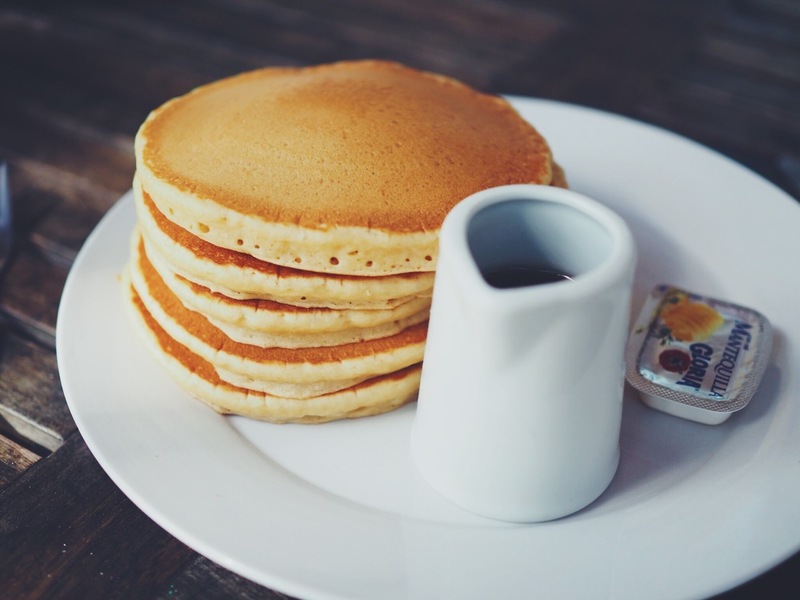 However, we probably wouldn’t recommend the place unless you come in a group (so you can try more of the dishes), don't mind a long wait and are prepared to splash out! 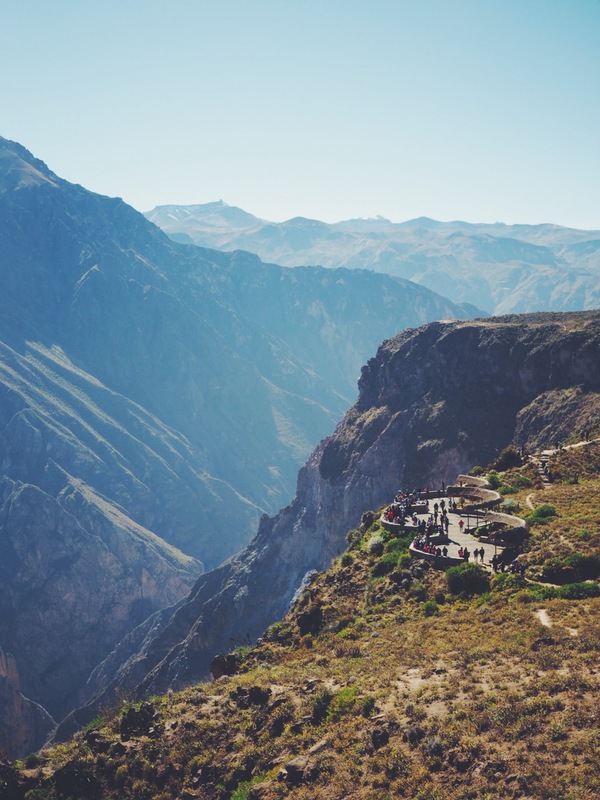 Colca Canyon is the most popular place to visit from Arequipa, and being the second deepest canyon in the world (more than twice the depth of the Grand Canyon in Arizona) and with stunning scenery it's not hard to see why. We had met a couple of travellers at our hostel the day before who had told us the 2 day trek was pretty intense and that it was much better to do the 3 day option, so taking their advice we booked the slightly longer trek from our hostel. The tour agency was called Oasis Palmeras Travel Tour, and having read good reviews online and with a time-efficient itinerary for a decent price, we felt confident we would enjoy our trek. We got picked up from our hostel at 4am to get the 3 hour minibus to the Colca Canyon with a few other trekkers. 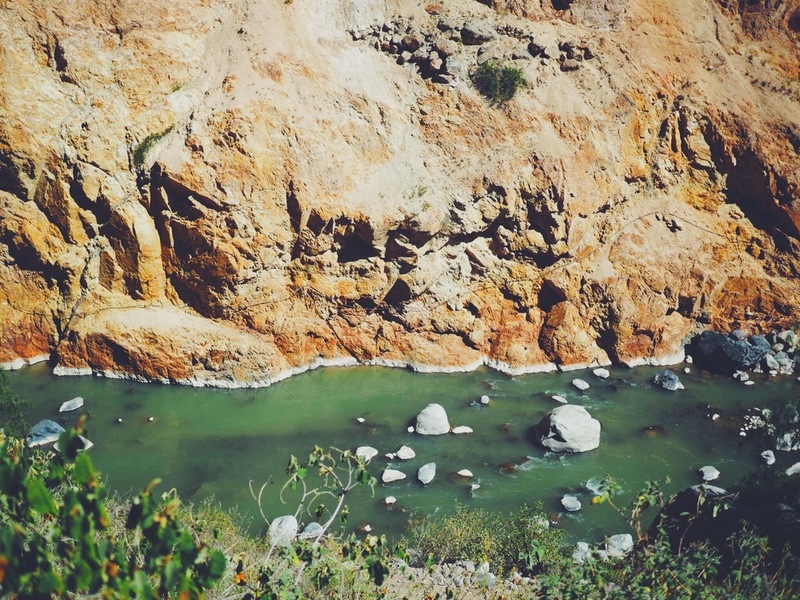 After driving for a couple of hours the sun rose and we began to see the incredible scenery that led to the canyon, with green hills, Inca-style terracing and the impressive mountains that made up the Salinas and Aguada Blanca National Reservation. We stopped for a quick and basic breakfast at a small cafe before continuing to our first stop, Cruz del Condor. 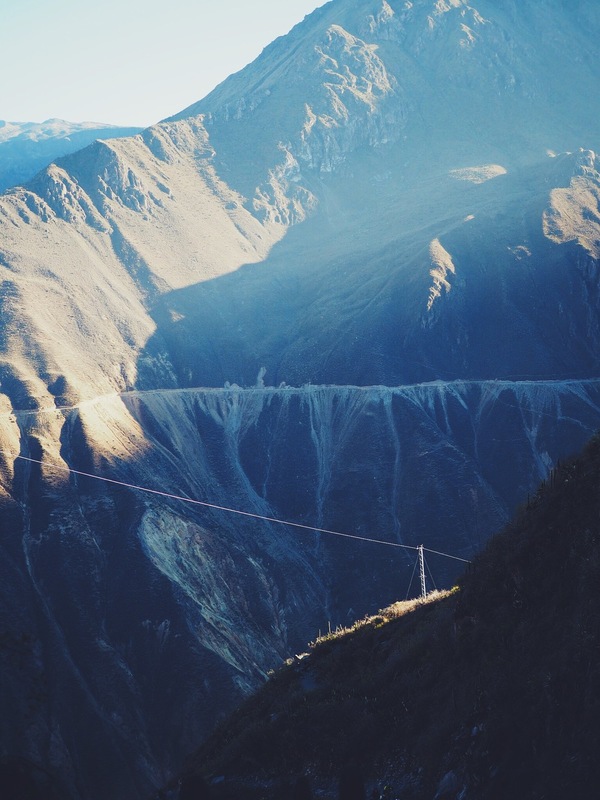 Cruz del Condor is a popular tourist spot on the way to the Colca Canyon where you can see giant Andean condors, a huge bird with a wing span of up to 3 meters and an important icon of South American culture. When we got there we found swarms of tourists already there, but luckily the condors didn't seem phased, and silently glided all around us in their numbers, often flying right overhead. After getting a few photos we got back in the minibus and were driven to the starting point of the trek. We met our guide and introduced ourselves to our fellow trekkers, including a French couple and a group of elderly guys from Holland. 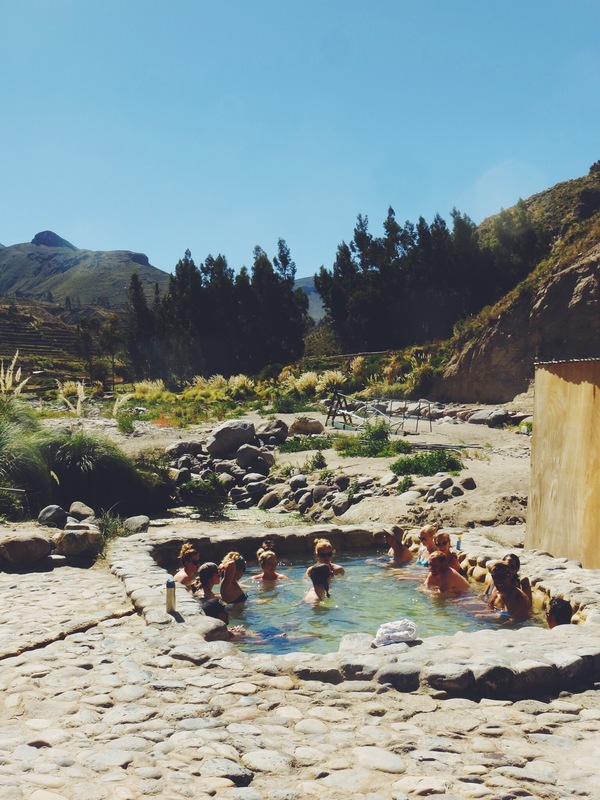 Before we set off our guide explained the reason behind the name 'Colca', originating from a combination of the Inca settlements Collagua and Cabana (hence Col-Ca). 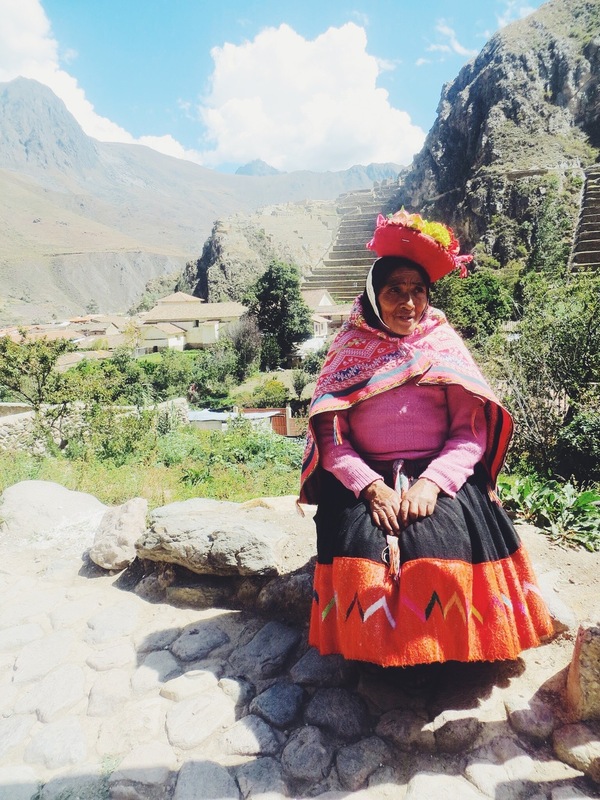 He also explained that a Colca is a kind of Inca food store built into the mountains. We the set off in our small group down the steep canyon path, edging deeper each step we took, taking in the incredible scenery as we went. About 2 hours later we approached the bottom where we arrived at a river crossing, and took a much needed break from the heat in the shelter of a shaded hut. After we got our breath back we crossed the bridge and headed up a short but very steep path. At the top we took another break amongst bunny ear cacti and from there it was only a 20 minute walk through farmland along flat terrain (much to our relief) to our lodging. We finally arrived at our accommodation, a farmhouse settlement with a few rooms and a small restaurant. We had a lunch of soup and Lomo Saltado (fried steak and peppers with rice) and chatted to the other Trekkers. 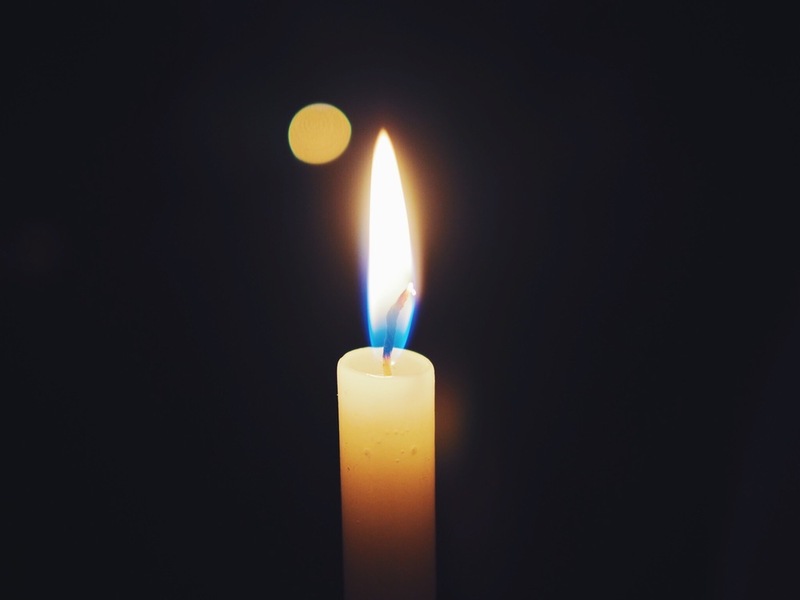 We then went for a short siesta, finding that our rooms were basic but cosy, and only lit by candle light. After a relaxing afternoon we grabbed a few beers and watched the incredibly clear starry sky before dinner and bed. On the second day we woke around 7am and had a great pancake breakfast before we started our trek. To our relief we were told that the days trek would be much less steep as we were now deep inside the canyon itself. 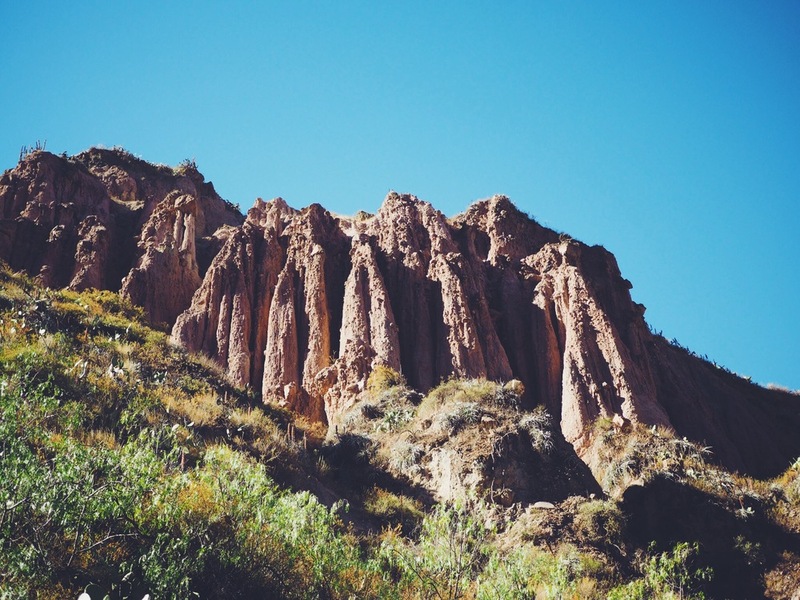 Our guide led us along the stony path, pointing out some interesting landmarks such as the '5 warriors', a series of statue like rock formations and an ancient Inca waterway carved into the vertical cliffside. It was a lot hotter lower down the canyon, and as the heat of the day approached the trek became a little more tiring, despite being less challenging in terms of terrain. We took a rest at a small family farm, and got a much needed cold drink and some snacks to keep our energy levels up. The lady who worked there offered us some cactus fruit, which was really tasty if you could avoid the spines! 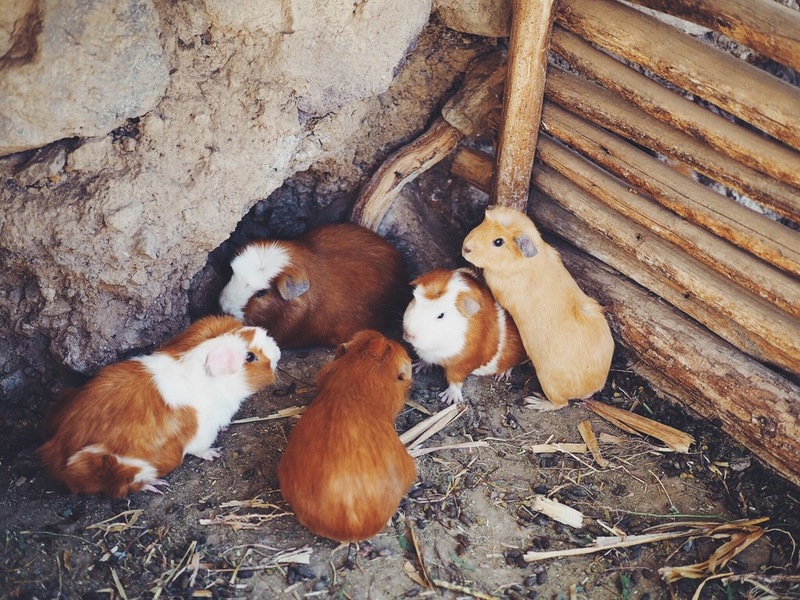 Shortly after an excited little Peruvian boy, who was spending his holidays on the farm, showed us the various animals that lived there including ducks, chickens and a lot of Guinea pigs (or cuy) stored in a series of hutches - all of them clearly would end up on the menu! After exploring the farm and saying our farewells to the family, we set off once again through the canyon, passing through small towns along the way. The scenery was spectacular and the sheer size of the canyon walls never seemed to grow old. We continued along the canyon path where we gradually started ascending and descending up and down the dusty path. As we approached 3 hours of walking we started to see the green Oasis de Sangalle nestled in the bottom of the canyon. We could see waterfalls leading to a river that flowed right through the middle, with tropical plants and palm trees surrounding them. With this very inviting view in sight we descended quite quickly, keen to take off our shoes and relax after a day of walking in the heat. Finally we arrived at the Oasis de Sangalle, and wandered past a few other hostels and hotels before finding ours, the Paraiso las Palmeras Lodge. It was absolute paradise, with our own small private hut and a large swimming pool surrounded by palm trees in the most idillic setting. Taking advantage of the sun we quickly changed into our swimming gear, grabbed a beer and dived into the refreshing pool to cool off. The sun set fairly quickly in the canyon (around 4pm) due to the surrounding mountains, and so once the pool became shaded we got changed and headed to the bar for a few drinks with the other trekkers. This led straight into a typical Peruvian dinner (soup, rice and meat) which filled the gap. Feeling tired after this we headed to bed early before our final day and the big ascent. After an early night and chilled afternoon the 4am start wasn't too painful, but the temperature had dropped substantially over night so it still wasn't that pleasant. We followed our guide upwards, using our torches to navigate the stony pathway in the dark. After an hour the sun started to rise making it a bit warmer making for ideal trekking conditions. The higher we'de climb, and the further we walked from Sangalle Oasis we really began to appreciate how isolated it was. Spreading the trek over three days meant we were well rested and with the help of some snickers we powered up in a time of 2:15 mins, even with multiple stops for photos on the way which we felt was quite an achievement for us! More impressively though, was that one of the guys in our group (aged 70!) also made it to the top which was really inspiring to see. At the top of the canyon there were many people congratulating each other on making it up and taking victory photos. We took a much needed breather and got a few group shots ourselves before heading along the remaining flat path to a small town. We then walked to a little breakfast spot with a few other groups, and had eggs, bread and coca tea to refuel after our intense morning trek. Once we'd finished breakfast we continued in the minivan on the road back to Arequipa, and stopped off at at the Apachetas of Chivay, a series of cairns thought to be made by the Incas, with an amazing mountain backdrop. The sheer number of them scaling the valley with a clear blue sky was an awesome sight. Additionally, and much to our surprise, we were shown the snowy peak of the Mismi mountain and were told that it is thought that it's glacial stream is the most distant source of the mighty Amazon River! 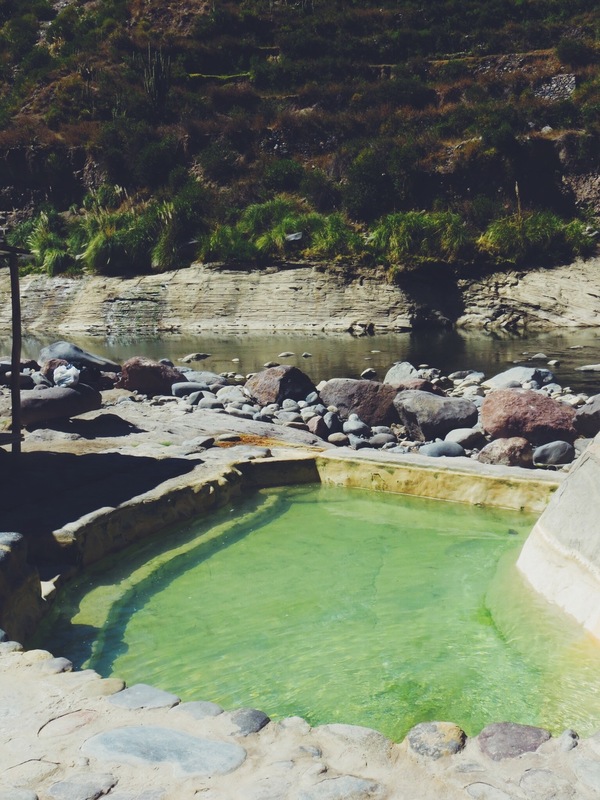 One thing we were really looking forward to on our trek was the Tambo hot springs. We made our way there, keen to soak our tired legs in the hot water. After walking down a short path and crossing a river we arrived at a series of pools. There were a few people in already, who warned that some of them were scorching! We decided to grab some cold victory beers while we dipped our toes into different pools to find the best temperature, and slowly lowered ourselves into one that felt as hot as we could manage. After a few minutes we got used to the temperature, and relaxed for half an hour or so in the steaming natural spring water with our fellow trekkers. Our feet and legs felt almost fully rejuvenated as we made our way back to the bus and continued on our journey back to Arequipa, and was more than worth the 10 Soles entrance fee. While we were there we met with Amanda and Daniel, an Australian couple we had met during the trek, and enjoyed some beers together in one of the milder pools. Continuing onwards we were taken to the small town of Chivay for lunch. The whole group piled into the Los Portales de Chivay restaurant where a large buffet table was on display with various typical Peruvian foods. Luckily it was an all-you-can-eat menu, meaning we could go to town! While we ate a local band started playing in front of our table, singing traditional music with pan pipes and guitars. Once finished we were then back in the mini bus and headed up towards our next look out of the nearby volcanoes. 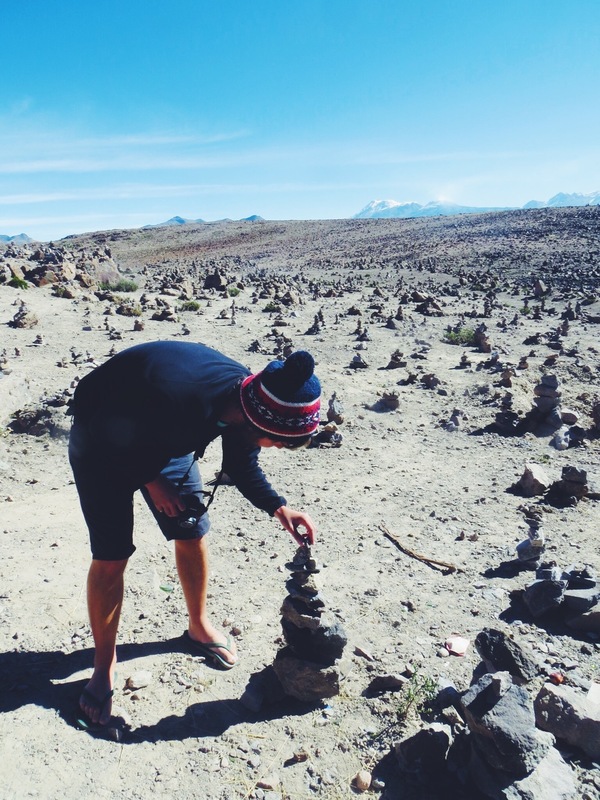 The air temperature was really cold as we had reached an altitude of 3,650 meters, and so we only spent a few minutes there to get some pictures, but it was great to see the smoking Volcan Hualca in the distance and the hundreds of small rock piles that had been carefully balanced. 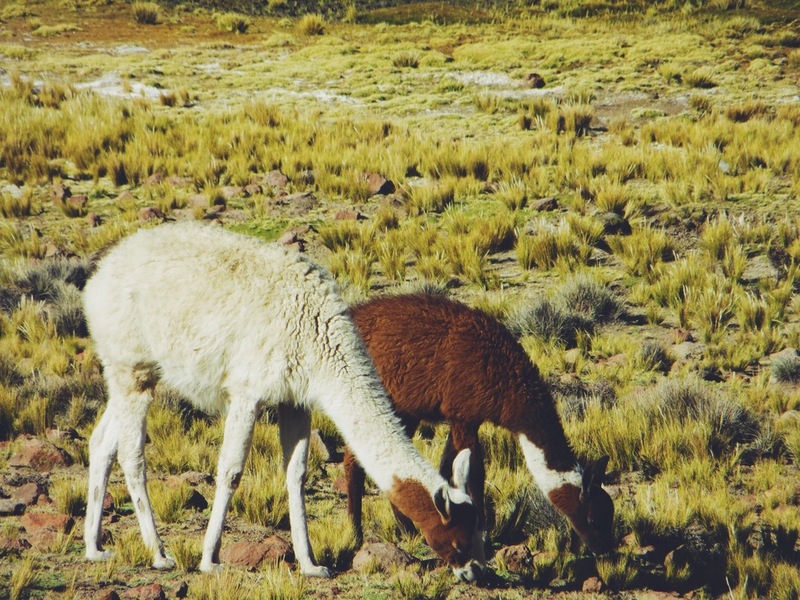 We then headed a little further to a Llama park where wild Llama and Guanaco were roaming in the green and yellow fields. 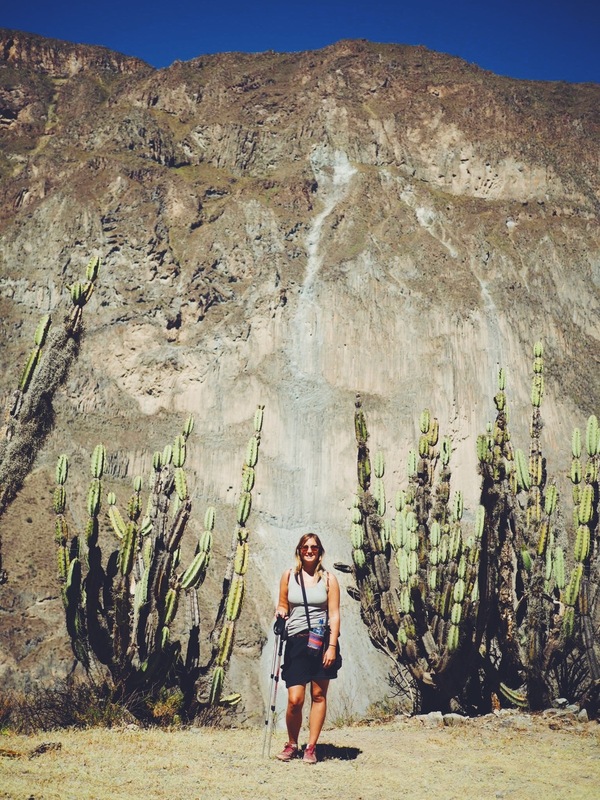 Our 4 days in Arequipa and Colca Canyon affirmed our decision to stop there during our trip. 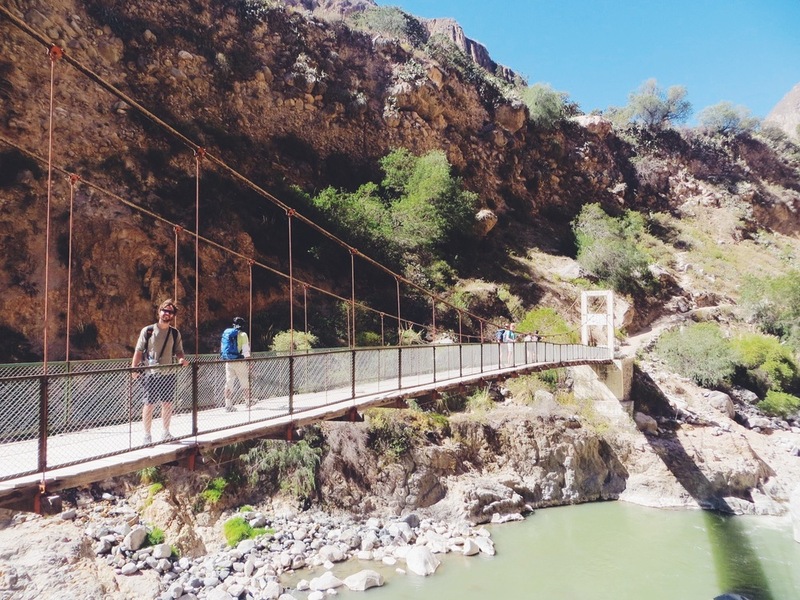 We loved the architecture, food and vibe of the city, and the Colca Canyon tour was probably one of our favourite treks of the trip since Patagonia. Having a well organised tour really did make a difference, and the incredible scenery and landscapes made the steep and often tiring stretches more than worth it. We were also lucky enough to have a friendly and like-minded group who helped make the three days even more enjoyable. The canyon oasis and hot springs were a luxurious surprise for us, and extremely welcome for our legs after the inclines. We left Arequipa feeling energised, keen for more exciting adventures ahead. After visiting Machu Picchu we wanted to get our fix of wildlife during our time in Peru, so during our time in Cusco we visited various tour agencies to find a good deal. 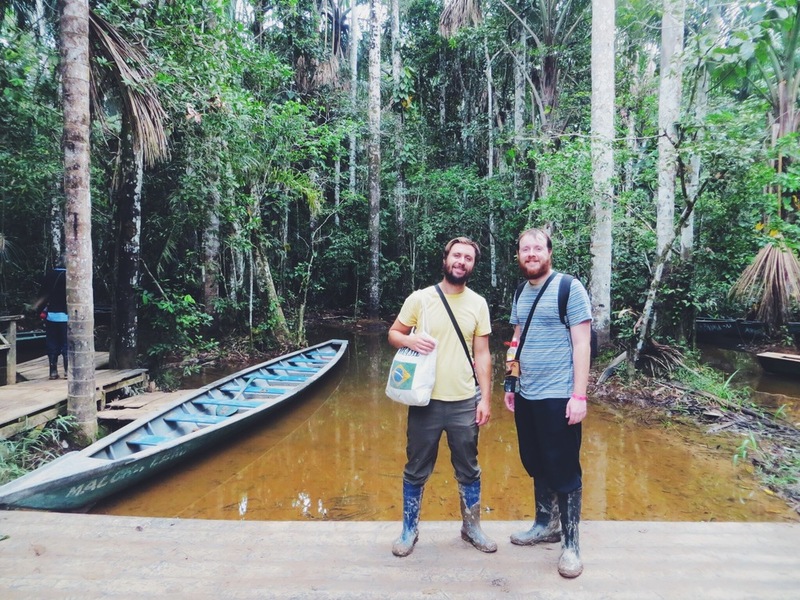 We decided on the Tambopata National Reserve, accessed through Puerto Maldonado, a dusty and slightly run down city in southeastern Peru. Getting there was much cheaper on land than by air, so after a fairly comfortable 12 hour night bus from Cusco we arrived at the bus terminal in city centre. During our 4 day tour at Monte Amazonico Lodge we were promised abundant wildlife including giant river otters, anacondas and macaws. Knowing wildlife can be very temperamental, we tried to manage our expectations on our journey there, but were excited for another chance to try and glimpse more of the South American wildlife none-the-less. After arriving into Puerto Maldonado early morning we were picked up by our tour agency and driven to the office to finalise our itinerary and grab a quick bite to eat. 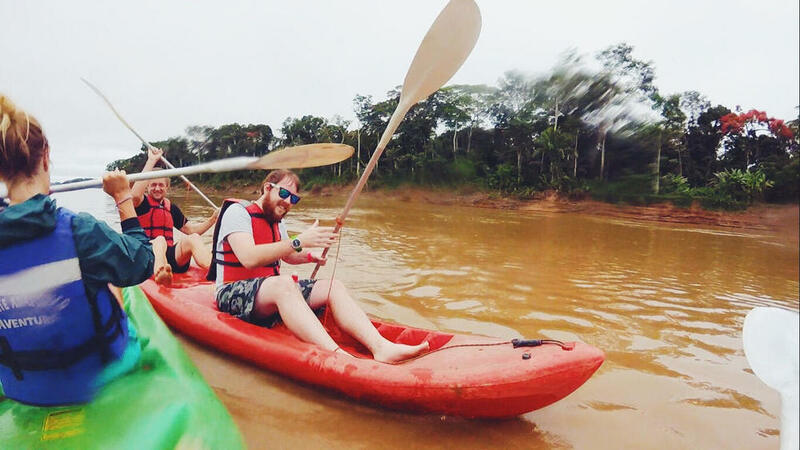 Shortly after we met with the rest of our group, boarded a long boat and set off down the Madre de Dios River, and within thirty minutes we had pulled up to our jungle lodge situated right on the river bank. With a huge central common area complete with a pool and foosball table, kitchen and bar as well as double rooms set amongst a forest clearing, we were pretty impressed with the place! It was a great base to spend our adventures in the jungle for the next 4 days. First on the tour agenda was a forest walk with our guide, Tito, a local Peruvian who clearly had a lot of experience and knowledge of the jungle and its inhabitants. 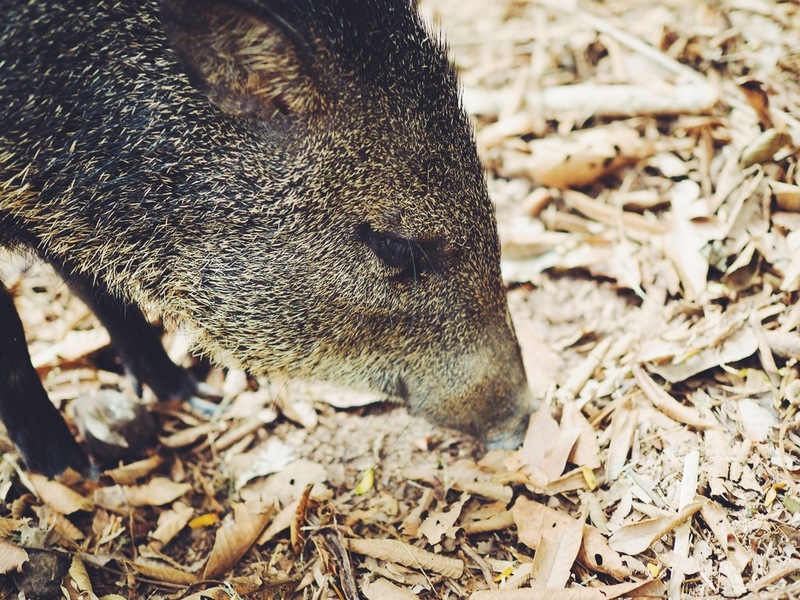 As we congregated outside the lodge we were greeted by a lively wild pig (a white-lipped peccary), who was very friendly and joined us on our walk. As we set off (admittedly not far from the lodge at first) Tito began to explain about the various plants that were native to the Peruvian jungle, and the way in which the locals used them for medicine and building materials, as well as the dangerous ones to avoid! We also learnt that the soil is actually very shallow and nutrient-poor in the jungle, and how the trees and plants overcame issues of stability and water collecting by having widespread roots, such as buttress roots. One of the most interesting trees was the 'walking palm', a tree which literally moved as it grew new roots in search of nutrients. We realised very quickly that we had to be very careful where we put our hands, as many of the trees had spikes and toxins. Another really interesting three was the cecropia, found in a little clearing with no other plants around it. We learnt that it had a symbiotic relationship with the cecropia ants, and as soon Tito tapped the tree an army of ants came out of the trunk to attack, acting as a defence for both their home and the tree. Many of them actually ended up biting him, which although looked a bit painful, was difficult not to find a little bit funny! 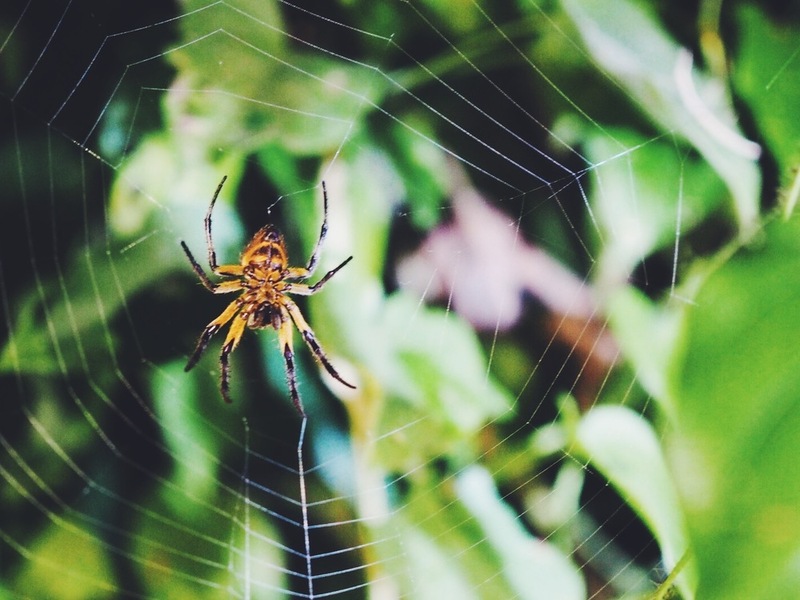 We then continued deeper into the jungle, spotting many interesting insects and spiders along the way, and even came across a giant millipede. After an hour or so of walking through the jungle we arrived back in the lodge for a tasty three course lunch and had a quick swim in the pool. We then set off in the long boat across the river to the appropriately named Monkey Island. 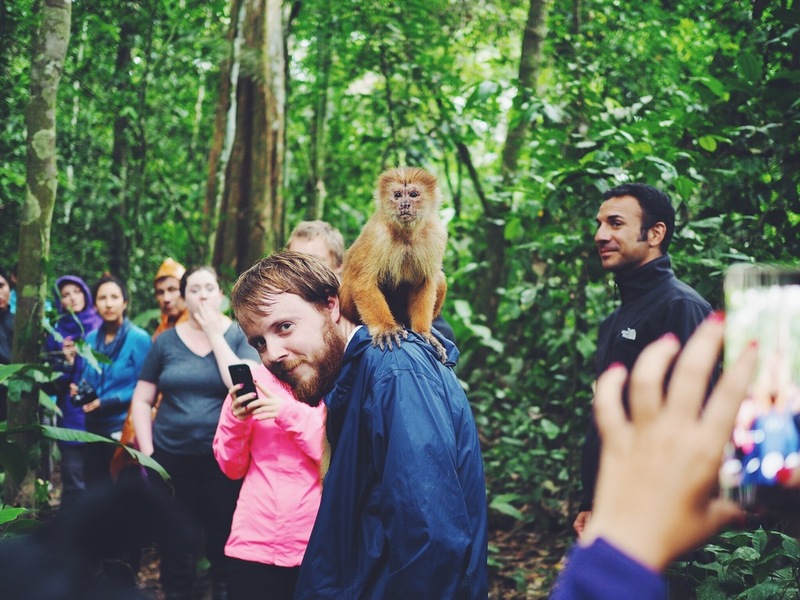 We weren't walking for long when we came across a family of capuchin monkeys in a clearing. As soon as they saw our group they came running towards us, clearly keen to see what food we had to offer. One took a great shining to Tom in particular (we believe it was to do with the colour of his hair!) and even climbed onto his shoulder! It was great to see the monkeys so close, but once the guides started feeding them they started to become more aggressive (much more so then in the Pampas where it is forbidden to feed them). Sensing the aggravation our guides said we had to leave, so after getting a few snaps we headed to the boat. However, the experience was over so quickly we couldn't help feeling a little bit short changed. On the plus side this meant we had to time to chill in the hammocks back at the lodge, play pool and have a few beers before our night boat ride. Once night fell we headed by boat to the banks of Monkey Island in search of baby caiman. We came across them fairly quickly, and they were larger than the ones we'd seen in the Pampas. Tito (being fairly old school) jumped out of the boat onto the river bank, barefoot, and tried to catch them with his hands. Unsurprisingly the caiman didn't seem to appreciate this, but fortunately for them they escaped him every time! As we continued along the river, much to our delight, we spotted two adult capybaras with our torch lights, and after closer inspection we realised it was an entire family with two infants grazing amongst the grass. We turned off the engine and watched them quietly for a short while before turning back for a hearty dinner and much needed sleep. The next morning we were up at 4.30am for an early breakfast before heading to Sandoval Lake. 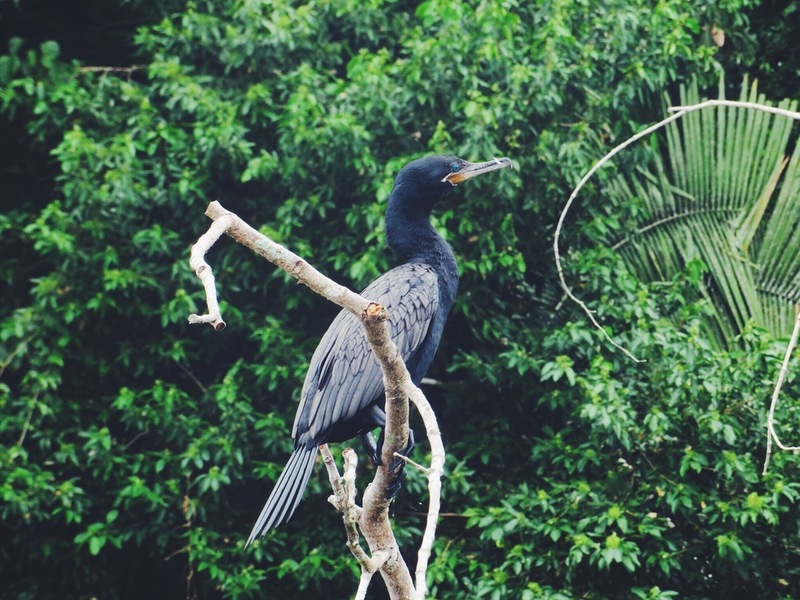 Sandoval Lake is a large lake situated in the middle of the rainforest which is notorious for spotting wildlife, including giant river otters and many types of birds. To get there it you need to take a boat and then walk for about an hour down a very muddy path, which was quite challenging due to the rain. The jungle was much cooler than we had thought, and Tito explained that cold winds from Patagonia were currently blowing through this area of the jungle. Apparently this meant that the wildlife would be less abundant, and so we set our expectations pretty low. After walking for an hour we arrived at a small, shallow dock with a few boats waiting for us, and once aboard we slowly paddled down a narrow river. We passed underneath a group of howler monkeys, who made their presence known with the booming noise that gives them their name. We then arrived at the lake opening and were met with an impressive expanse of palm tree lined water. Almost immediately we spotted two giant river otters diving for fish, and even saw one munching contentedly on a piranha! We were so pleased to see this amazing animal in the wild as the are extremely rare, with only around 1,000-5,000 left in the world, and we sat and watched them until they disappeared into the mangroves. We then set off to explore the rest of the lake, amazed that we had the chance to see such a special animal in it's natural habitat. We spent a good two hours or so quietly circling the lake, spotting beautiful herons, hoatzins and kingfishers darting amongst trees. 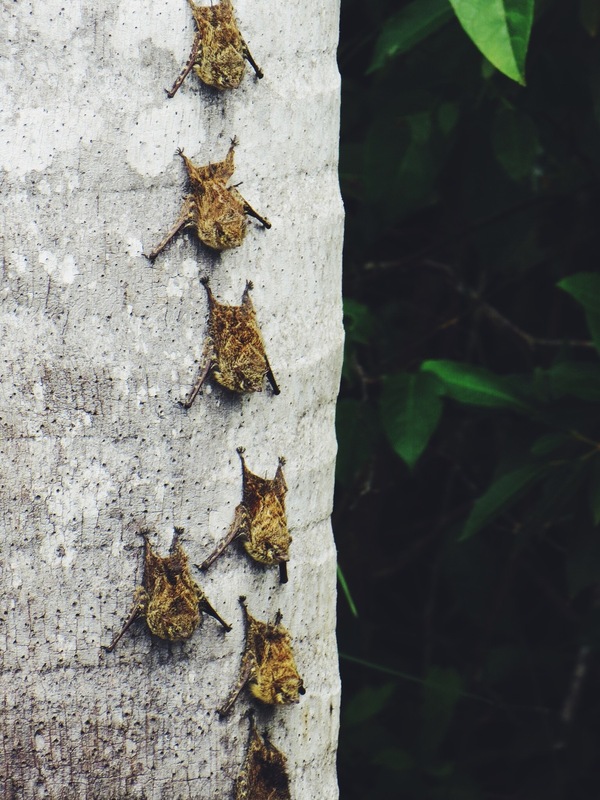 We even got to see a group of sleeping bats clinging onto a tree trunk. Tom with his sharp eyes managed to spot of the eyes of a lurking black caiman from quite a distance, a species notorious in the area. 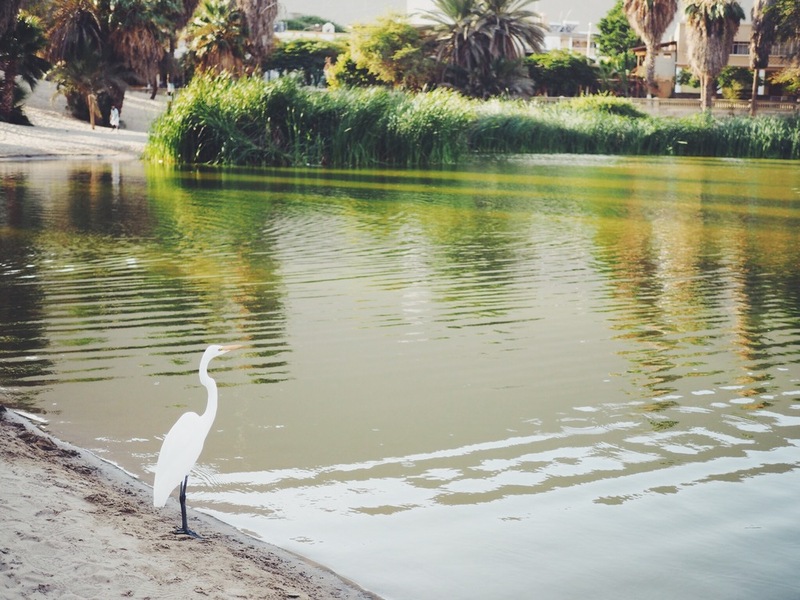 The lake was really beautiful, and it was easy to understand why it was such a great place to watch the wildlife. It was also nice not to have the engine running, as it allowed us to hear the noises of the jungle all around us much more clearly. Around mid day we then headed back to the lodge to relax once more in our hammocks, and waited until dark for our night walk. We set off in to the darkness of the jungle with torches, and it was very noticeable how much louder and alive the jungle had become. We began to realise the wildlife was far more active during these hours, although a lot harder to spot. We spent an hour creeping quietly through the trees, keeping our eyes peeled for the various insects, spiders and snakes that inhabited them. We spotted gigantic bullet ants in the trees (with the most painful sting in the world! 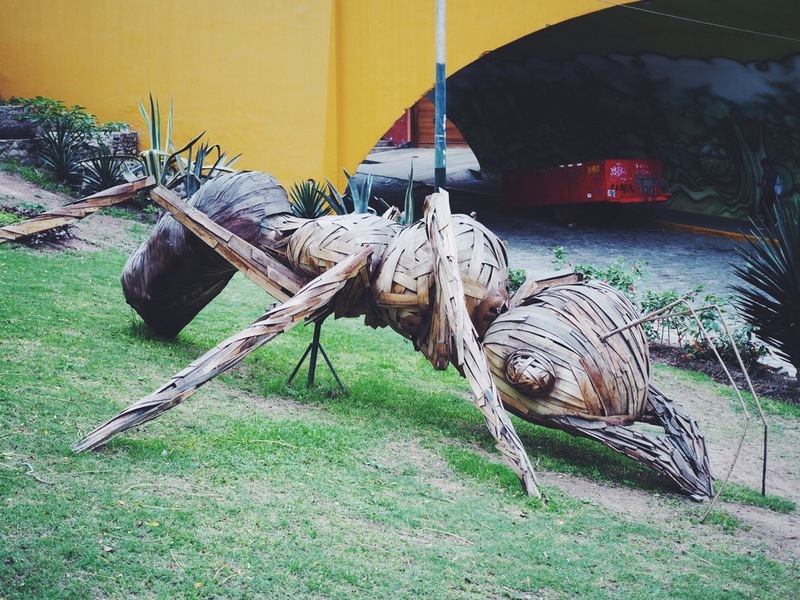 ), tarantulas, giant snails, butterflies and even a huge praying mantis! The next day we prepared for a day of activities including kayaking, fishing, and a canopy walk. First on the agenda was piranha fishing in a small creek not far from our lodge. After our failed attempts in the Pampas we were hoping for more success, but weren't holding out! Using very poorly made rods and thick line, it was no surprise that we were not successful, although our captain managed to catch a catfish. There were substantially less nibbles than our previously time so we'll put our luck down to much fewer fish! We then headed back to the lodge, picked up the kayaks and headed up the river for a down-stream kayaking session. Just as we were pulling up to a spot we saw a huge caiman on the river bank, and so decided to head a little further up to avoid crossing paths! As with most of the activities during our tour the kayaking experience was short, and after around 10 minutes we found ourselves back at the lodge again. This was a little frustrating as we thought we'd have at least an hour or so, but it was still fun to paddle and get a bit of exercise none-the-less. After lunch we were kitted out with harnesses and set off back into the jungle to begin our zip-lining and canopy walk. The platforms felt just about safe enough, and once at the top and strapped in we began flying amongst the jungle canopy. The zip lines were pretty fast, and so reaching the end was always a bit nerve-racking as it either resulted in smacking into the tree in front, or braking way too hard and ending up falling short and needing to be pulled up by our guide. 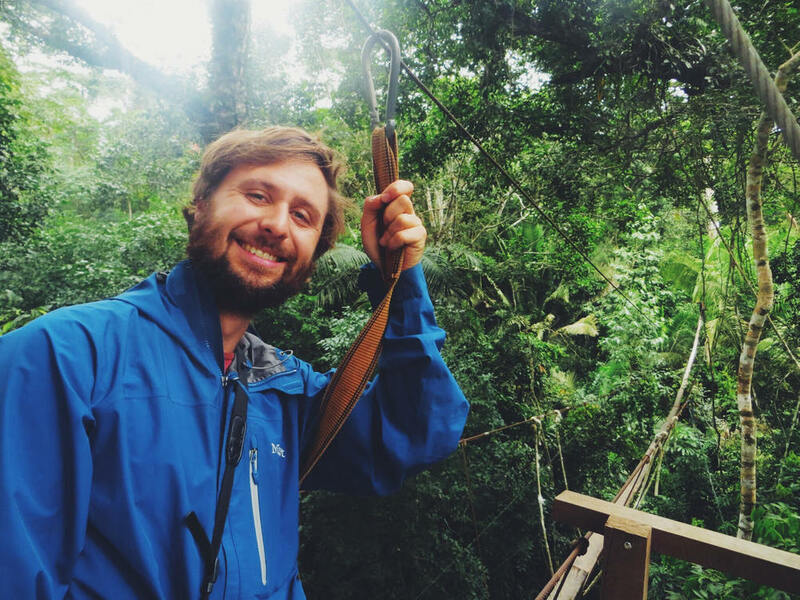 Next we crossed over a very narrow wooden plank, and then a bridge taking in the amazing jungle canopy below. Our understanding of our last morning was that we would be up really early to head to the parrot clay lick, but due to a mix up from our agency, our guides didn't seem to think it was on the agenda. We were quite annoyed by this as it was something we were very much looking forward to, and so had to have a few awkward conversations in order to convince the guides to take us along anyway. Luckily for us another group was going at the same time, and agreed to sneak us onto the boat and drop us off at Puerto Maldonado on their way back, which we were very grateful for! At 3am the following morning we climbed into the long boat one last time and headed an hour upstream before pulling up next to the parrot clay lick. Our guides explained to us that the parrots arrive in the trees above in small groups, and then once they felt safe would descend onto the clay. It is thought that the reason they do this is because the mineral-rich clay counteracts the toxins found various jungle fruits and berries that they eat (basically parrot medicine!). It was also thought to be a chance for them to socialise with each other in large groups. One by one the blue headed parrots and chestnut macaws descended onto the licks in their hundreds, digging their beaks into the clay to access the minerals. We felt very privileged to see these incredible birds behave in such a way. After an hour or so of watching the parrots, a hawk flew close and fairly quickly the flock began to fly back into the forest, marking the end of the spectacle. 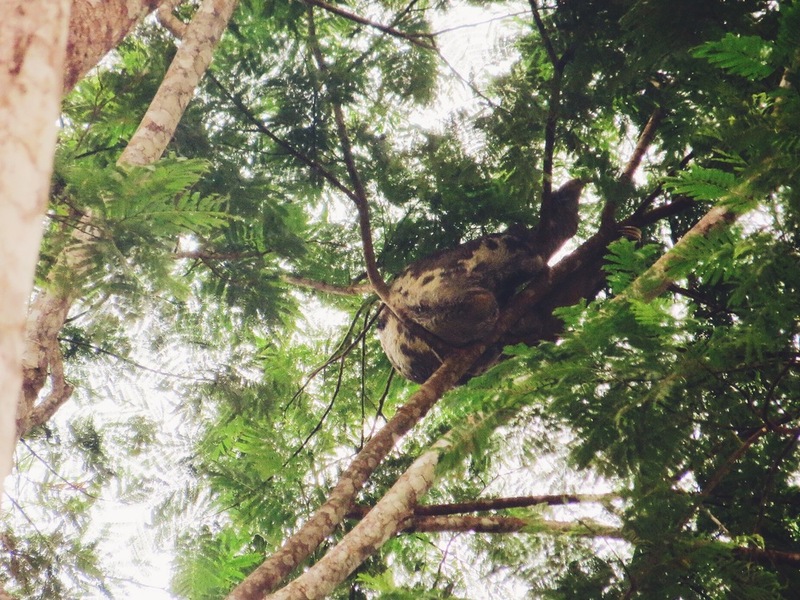 Just as we headed off, we noticed a boat in front of us had stopped and our guide explained that there was a sloth eating leaves in a very tall tree! It took our untrained eyes a while to spot it as it was very high up, but once we docked up on the river bank got a much better view directly below it, and watched for a while as it ate. Unfortunately, we didn't have a zoom lens and so found it very difficult to get a decent shot, but it was the first one we'd seen so we're happy regardless. We then headed back to Puerto Maldonado buzzing from our morning of wildlife and then not long after boarded our 10 hour bus back to Cusco. Despite some of the activities being a bit short lived, overall, we had a brilliant time in Puerto Maldonado. We managed to see all the wildlife we could have hoped for, in particular the giant river otters in Lake Sandoval. We were surprised at how much we enjoyed learning about the trees and plants, and the symbiotic relationships they have with the wildlife. We found it fascinating just how competitive every form of life needed to be in order to survive in the jungle. The parrot clay lick, monkeys, tarantulas and capybara were also fantastic to see, and the canopy and zip-line provided us with a bit of an adrenaline fix. 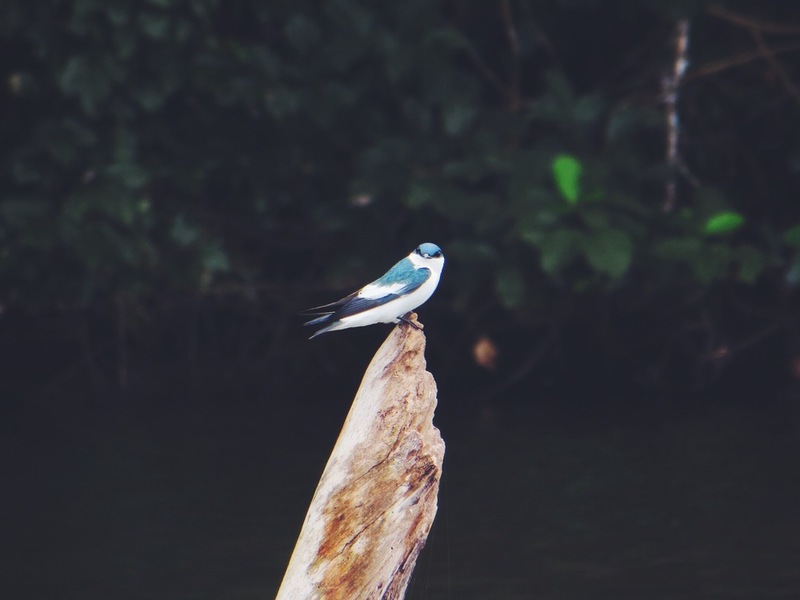 Our only regret is not having a decent zoom lens, as our photos didn't really capture the wildlife in the detail we would have liked. After being dropped back in the city we headed for a decent breakfast at Gustitos del Cura before getting our 12 hour bus back to Cusco. Machu Picchu marked the half-way point of our travels around South America; 120 days since leaving London behind. 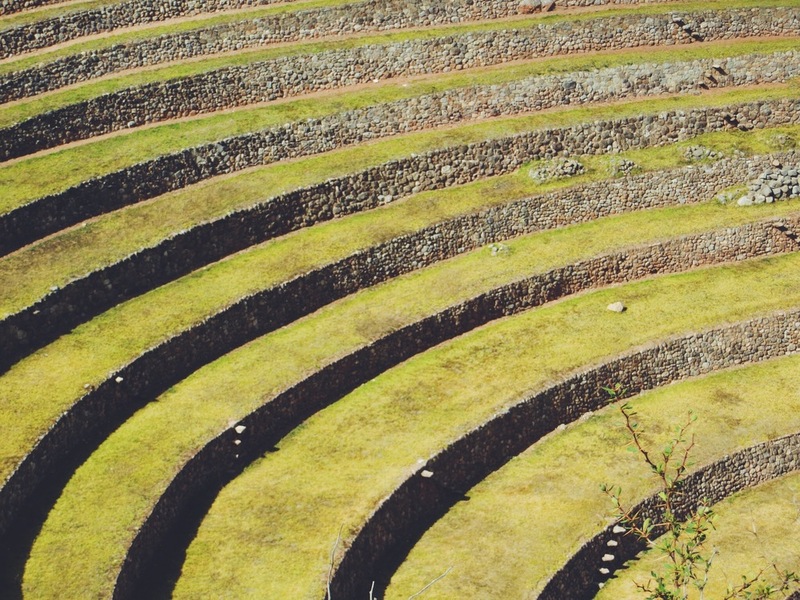 Arguably one of the most famous ruins in the world, and situated in the stunning Urubamba River valley, there's a reason why it's on a lot of travellers bucket list. 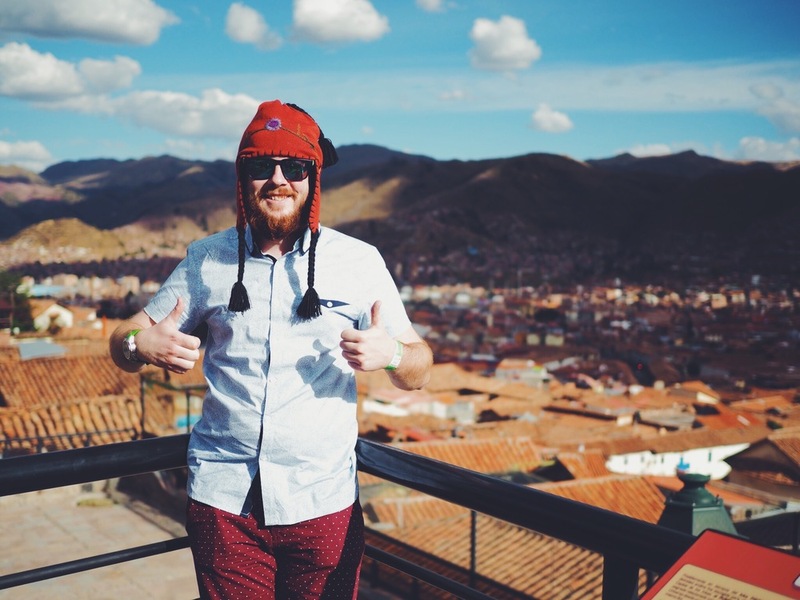 The ancient city of Cusco is the gateway to the world-renowned Inca Trail, and having heard great things about it we decided to stay there for 3 nights to explore the city before our trek. Unfortunately, 5 months in advance was still too late to book the full inca trail (to our annoyance) and so we settled for the 2 day mini-trek, which we were excited about none-the-less. 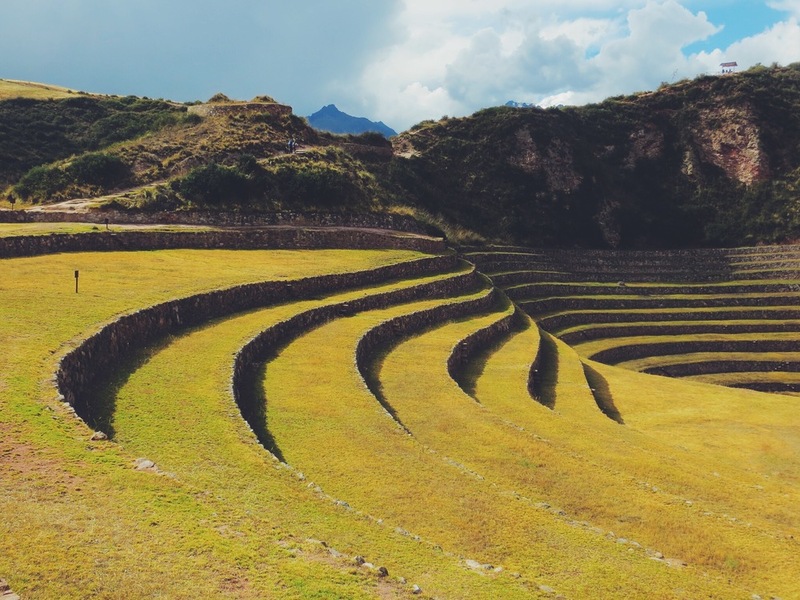 We were also keen to visit the Sacred Valley, a region filled with various archaeological sights and small villages, and so we planned a few key stop-offs on the journey from Machu Picchu back to Cusco. After getting a 7 hour night bus from Puno we arrived in city's main bus terminal at about 6am, and still feeling pretty tired we got a cab to our hostel for a few more hours rest. As our friend Tom from London was joining us for a couple of weeks, we decided to stay in the popular Pariwana Hostel, conveniently located in the city centre and boasting a pretty decent bar/restaurant and a ping pong table in their large courtyard. After showering and settling into our dorm, we decided to have a quick explore of the old city centre before Tom arrived. 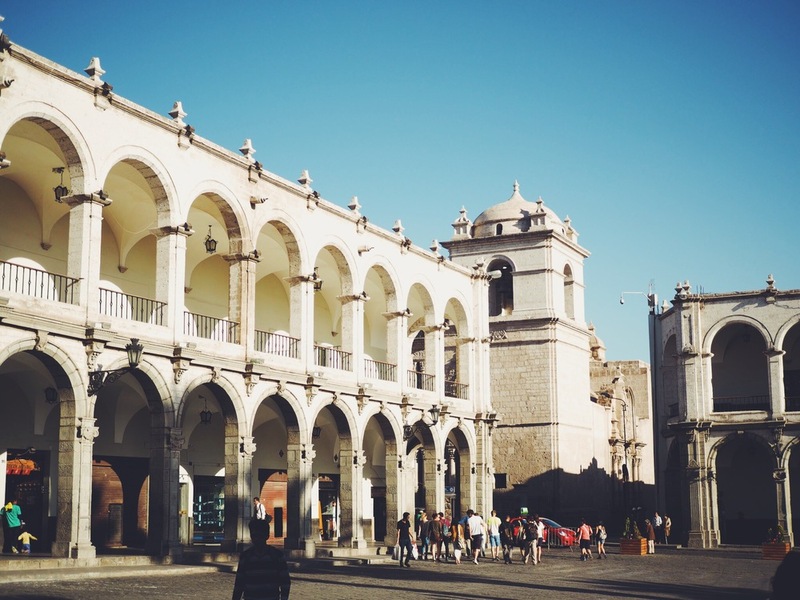 Our first port of call was the beautiful old Plaza de Armas square surrounded by Santa Domingo Cathedral, La Compañia Church and various other Spanish Colonial buildings. As we had acclimatised in Bolivia, the lower altitude in Cusco didn't affect us, and so once Tom arrived early afternoon (also unaffected by the altitude) we decided to take advantage of this and get stuck into some pisco sours. We then headed to Uchu Peruvian Steakhouse to sample alpaca steaks cooked on volcanic stones. The food was brilliantly presented, and the surf and turn option allowed us to try both the shrimp and steak cooked on hot stones at our table. The highlight was the desert, entitled 'chocolate madness' consisting of 3 amazing chocolate deserts including mouse, truffle and fondant. It was the best desert we'd had in South America and was eaten embarrassingly quickly by the three of us! From there we headed to a string of clubs including the popular 'Chango', turning it into a very fun and messy night! We woke up the following day with pretty bad hangovers (we had definitely lost our alcohol tolerance since travelling! ), and after recovering over breakfast at the hostel bar, helped by plenty of fruit juice, we decided take the free walking tour of the city. 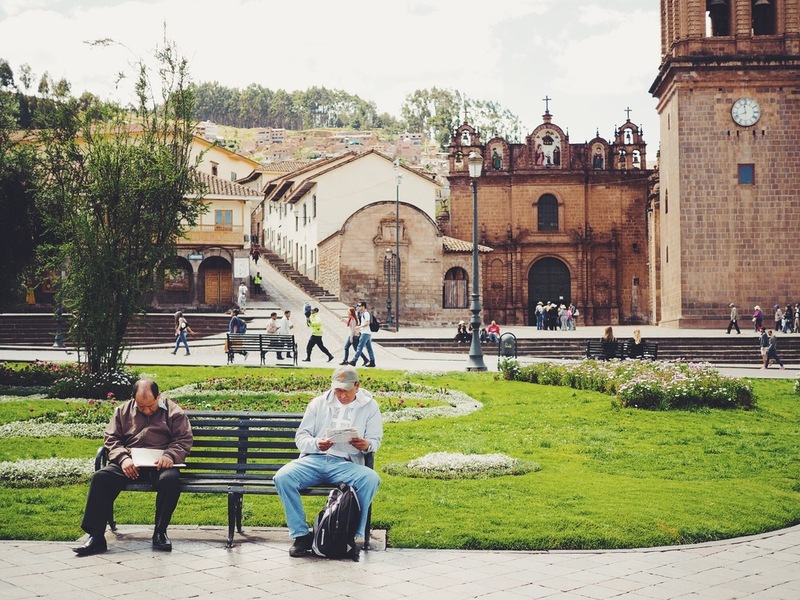 The tour started in the main square, where our friendly guide explained some of the history of Cusco, the capital of the Inca Empire and the oldest existing city in South America. He explained how many of the Inca temples and buildings had been destroyed and built over by the Spanish during their colonisation. It was interesting to hear how the two religions (Catholic and Inca) compromised both spiritually and culturally in order to keep peace once the Spanish had arrived. The group got a minivan to the top of the Pukamoqo hill, and within 5 minutes we had completely left the built-up streets of Cusco behind and arrived in the rural outskirts. At the top was the Cristo Blanco, a large white statue that ‘watches over’ the city. We also got a glimpse of Sacsayhuaman, an ancient inca fortress that overlooked the city. 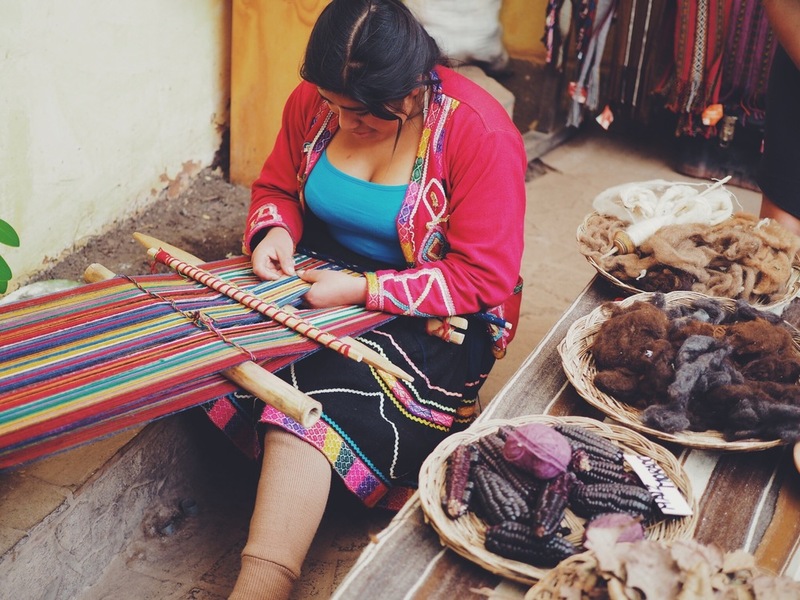 We then headed to a textile shop where a local lady demonstrated the colouring and weaving techniques used to create traditional Peruvian fabrics. She showed us the plants, spices and even insects that are used to create the various pigments in their colourful textiles. After the demonstration we headed back to San Blas, the boheniam district of Cusco to a small music shop where our guide played some traditional instruments including the charango, a small guitar made from an armadillo shell. We then walked through the San Blas area, taking in the beautiful cobbled streets, intricate balconies and small handicraft stores. The tour finished at Limbus Resto Bar for some food and a Pisco sour tasting session with great views of the city. We felt the tour gave us a great introduction to Cusco, and showed us some interesting places we otherwise wouldn’t have visited. 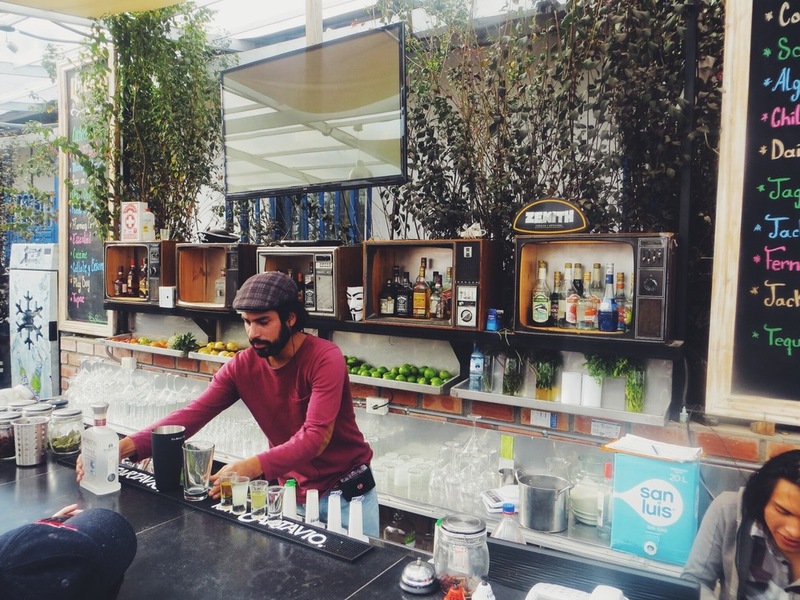 On our final day we decided to go for lunch at Marcelo Batata, boasting one of the best roof-top balconies in the city and with highly rated (although a little expensive) food. 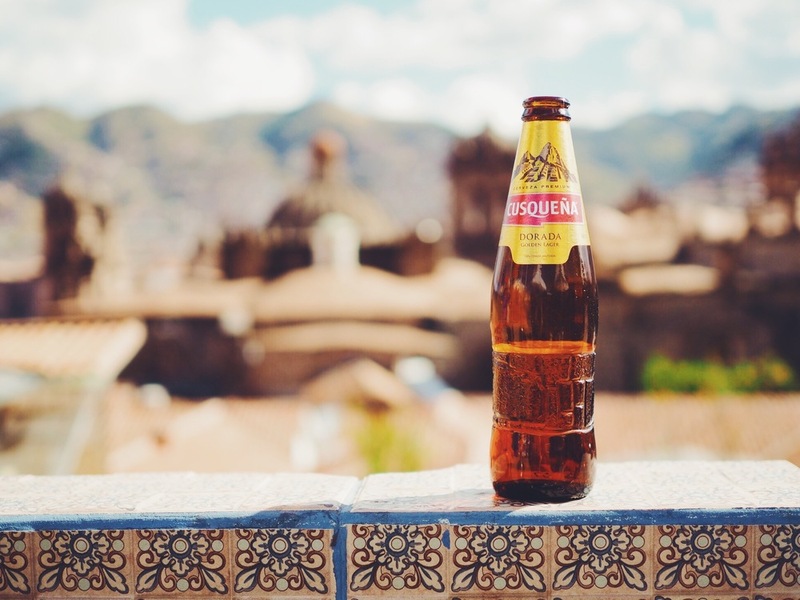 We opted for appetisers only to keep the price down, but all our dishes were beautifully presented and equally delicious, and as we basked in the sunshine we sampled the regional beer (Cusquena) as we looked out over the picturesque rooftops of Cusco. It was a perfect lunch time spot! We then headed back to pack for our 2 day inca trail, and after 3 days in the city we felt ready to hit the fresh air and finally see the world-renowned Machu Picchu. The day had finally came for our much awaited 2 day Inca trail. We were picked up from our hostel at 4am, and bundled into a rather bumpy minivan to the train station to board the train at Ollantaytambo at 6.10am. As we were picked up about 20 minutes late it felt as if we only just made the train on time, and being one of the most expensive train rides in the world we definitely couldn't miss it! After boarding we were given breakfast, tea and coffee and began our journey through the incredible Peruvian mountains, following the river Urubamba River until we reached 'kilometre 104' where we had to disembark. We jumped off the train with our day bags, and waited for the train to leave before setting off. Much to our luck, it had started to rain heavily just as we set off. We decided to not let it affect our spirits, and so once we were as soaked through as is physically possible (we should have brought rain ponchos!) we ignored the wet and focused on enjoying the amazing misty scenery as we trekked up the Inca stairway through the cloud forest. Following our guide, we hiked up the ancient stone steps, being careful with our footing as the drops were pretty sheer. 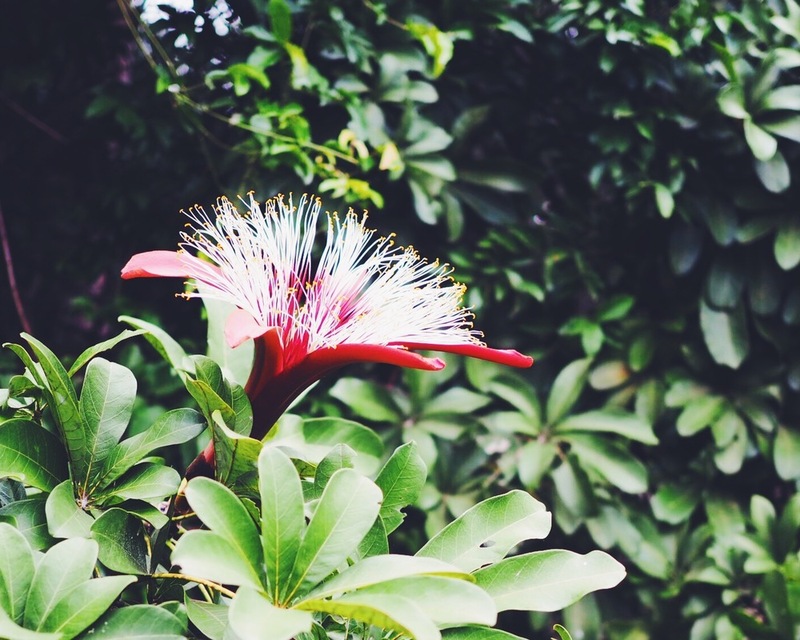 During our route our guide explained about some of the native plants that were used by the Incas, as well as the importance of water in the Inca culture, and that we should be thankful for the rain as it symbolised life! Over the next few hours we wound our way along the mountain ledges to some breathtaking scenery that either looked out over the amazing valley or led us through more jungle-type surroundings with fast-flowing rivers and waterfalls. Another thing that made our trek special was that that we were almost completely alone with our guide on the trail for the entire time. Although we would have loved to have completed the full 5 day trek, we had heard was that it was often very crowed on the trail, and having this spectacular scenery to ourselves was not something we had not expected, and we felt very lucky to be able to experience it in such a small, personal group. Around mid day the rain began to ease up, just in time for lunch and our visit to the amazing Winaywayna ruins, a series of inca farming balconies cut into the near-vertical mountain side. Our guide explained various historic features of the ruins that were specific to ancient Inca culture, including the incredibly sophisticated water system, the 'niches' (sacred storage) in the walls, and the exact positioning of certain windows that were used as astronomical calendars through the position of the sun. It was an amazing place, and so nice to see it with hardly any other trekkers there. After an hour or so of exploring the ruins we climbed our way up to the top to get the best view before continuing our trek. After another hour or so of walking we arrived at the Sun Gate, or Inti Punku, a door that was once the main entrance to Machu Picchu and the top most view of the ruins. Due to the rain, Machu Picchu was mostly covered in cloud, and we only managed to get a small glimpse of the ruins before descending to the bottom. Our guide explained that the iconic mountain seen in the typical photos of Machu Picchu is actually Huayna Picchu mountain (not Machu Picchu which is a common misconception). We walked through the ruins for an hour or so, but as it started to rain heavily again (and we were feeling pretty soggy!) we decided to head back and wait until the following day to do the detailed tour. 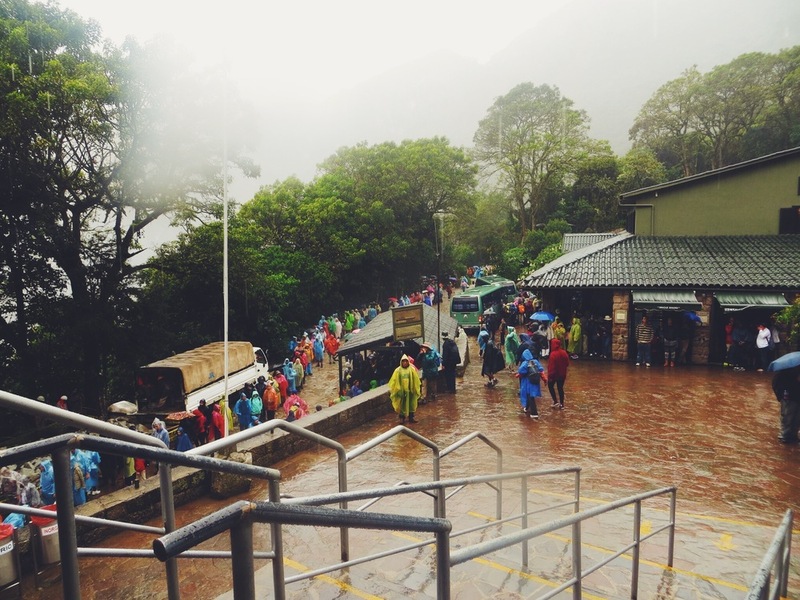 As we approached the bus bay we realised everyone had the same idea, and a huge queue had formed, meaning we had to wait for a not-so-fun hour and a half to get the bus to Aguas Calientes. In hind sight we can laugh how unlucky we'd got on our first day, but at the time it was pretty miserable! Once we arrived at Aguas Calientes, our bags and their contents were completely soaked through, so after checking into our hostel we sent all our clothes to the launderette, had a hot shower and tucked into the decent dinner provided by our hostel. There wasn't a huge amount to see in Aguas Calientes, and so we grabbed a few cold beers after dinner and relaxed in the warm hostel and prepared for another early start the following day. When we woke the following day we were relieved to find a perfect blue sky, and were excited (and a little anxious) to get to the top of Machu Picchu again to see it properly. We had learnt that the weather can be very changeable there, and so managed our expectations until we got off the bus at 9am. We were thrilled to see it was still clear, and we spent the first hour marvelling at the historic ruins from various angles, getting our stereotypical pictures along the way. The ruins really lived up to our expectations, with cascading balconies, blue sky, and the occasional wisp of white clouds and mist. It was a truly magical setting. After an informative 2 hours from our guide and exploring the majority of the ruins of Machu Picchu we walked to the inca bridge, a now closed-off pathway across a treacherous, narrow ledge with sheer drop that links up another ruin on the other side of the hill. Tourists are no longer allowed to walk across it as it's too dangerous, but it was interesting to see the risks the inca's took to build and connect their settlements. 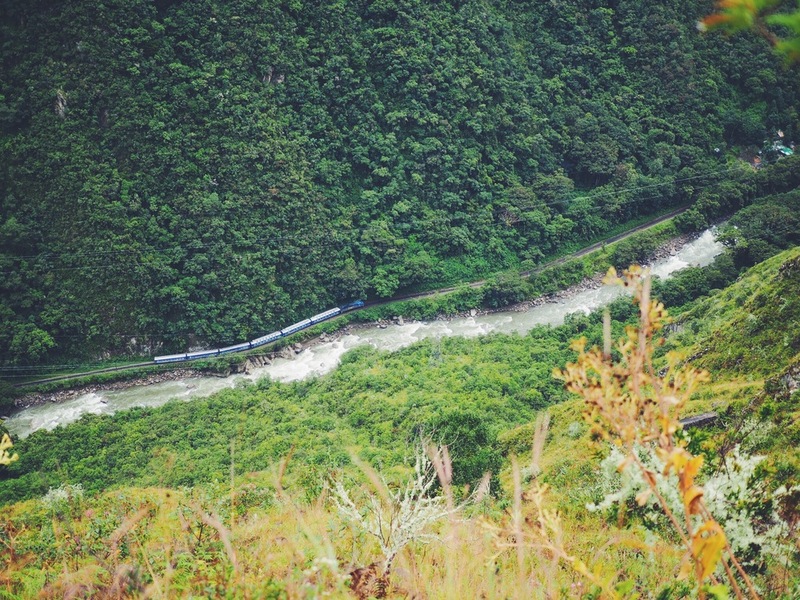 We then headed back down the hill to catch our bus back to Aguas Calientes, picked up our bags and jumped on the train towards the Sacred Valley, still reeling from how incredible our visit had been. 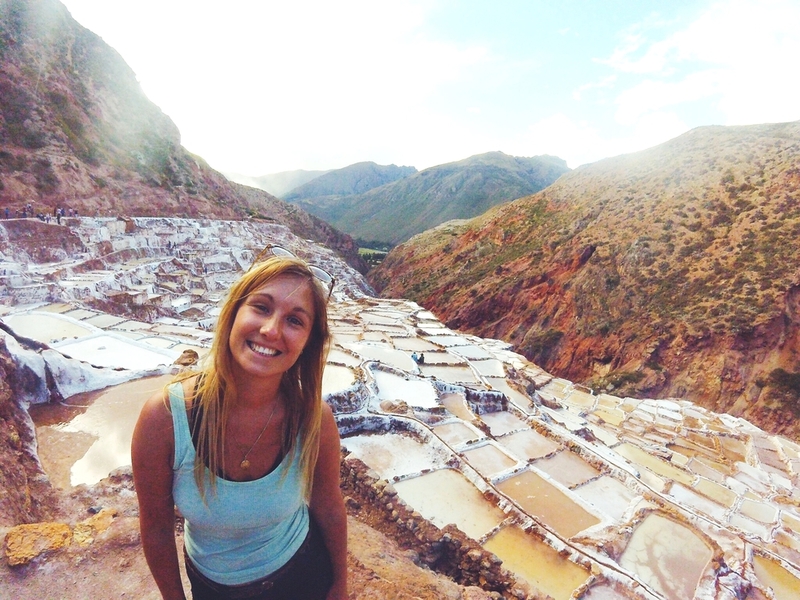 After our trip to Machu Picchu we had decided to visit the Sacred Valley on our way back to Cusco, stopping off at the circular balconies of Moray, and the impressive Salinas de Maras, a salt mine built into a mountain side. We got off the Peru Rail train at the small town of Ollantaytambo, about 80 km from Cusco. It was dark when we arrived, and so made our way to La Casa del Abuelo Riverside, a hostel we had booked a few days earlier. 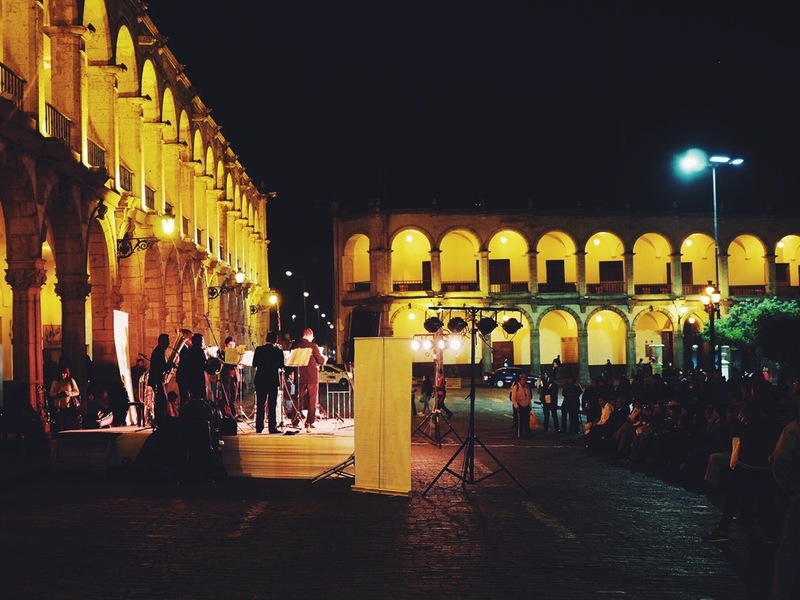 By chance we had arrived during a festival weekend in Ollantaytambo, and as fireworks, music and dancing were kicking off we decided to check it out. After witnessing a comically dangerous firework display in the main square, we headed to Mayupata Restaurant to sampled some of the local cuisine including alpaca, Peruvian rice pudding and a glass of Chicha, a sweet purple corn based beer. The following day we work early for our hostel breakfast of scrambled eggs and bread (a South American Classic) and made a plan for the day. 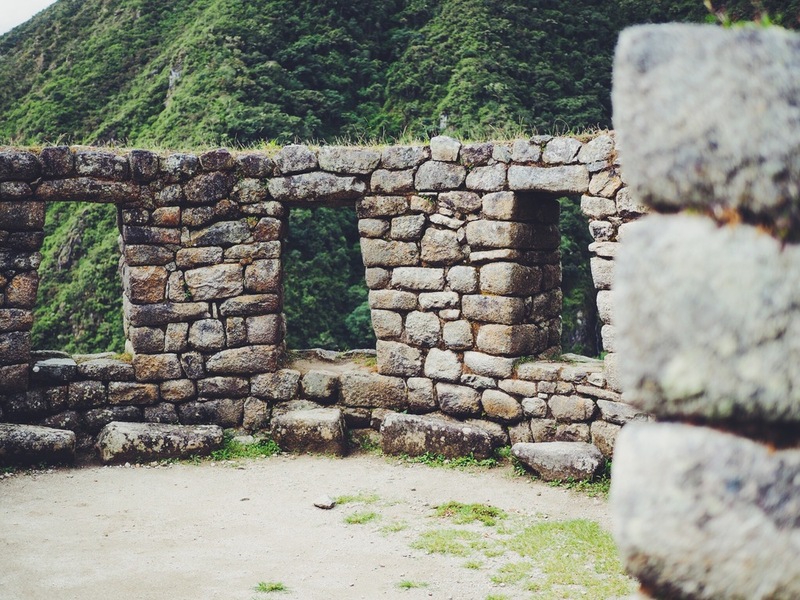 Our first stop was to visit the ruins of Ollantaytambo, and so we strolled around the fortress overlooking the town for an hour or two, seeing familiar inca architectural features that we recognised from Machu Picchu. We then had a quick lunch in the square. By this point the festival (which we discovered was the Santisima Cruz de Senor Choquekillca) was in full swing, and many groups of local gathered in the main square dressed in weird and wonderful costumes. It was a surreal experience, and some of the costumes were quite creepy! After lunch we hunted around for a taxi that would take us back to Cusco via the Sacred Valley stops for a decent price. After finding one for 30 soles for the 3 of us, we headed back to our hostel to pick up our bags, and jumped into the taxi and made our way to our first stop: the Moray ruins. 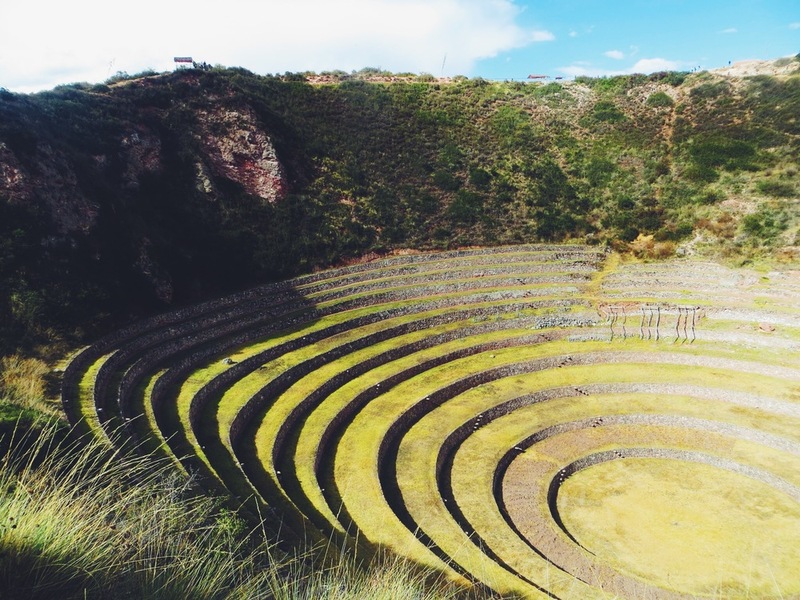 Having seen pictures of the archeological site in tour agencies around Cusco, we were excited to see Moray in real life. The perfectly formed steps orbited the crater, making it look like some kind of 3 dimensional crop circle. 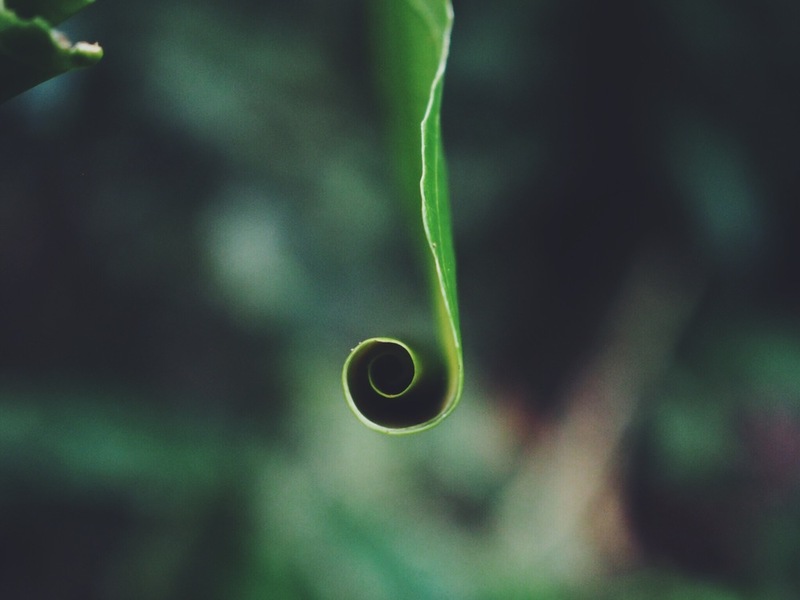 We learnt that the reason for the shape and design of the circular balconies was likely to be an agricultural experiment to test the growth rates of vegetables at different temperatures and altitudes (for example potatoes grow best in cooler, higher altitudes, and maize in warmer, lower altitudes). After around half an hour of exploring, we got back in our cab and headed onwards. 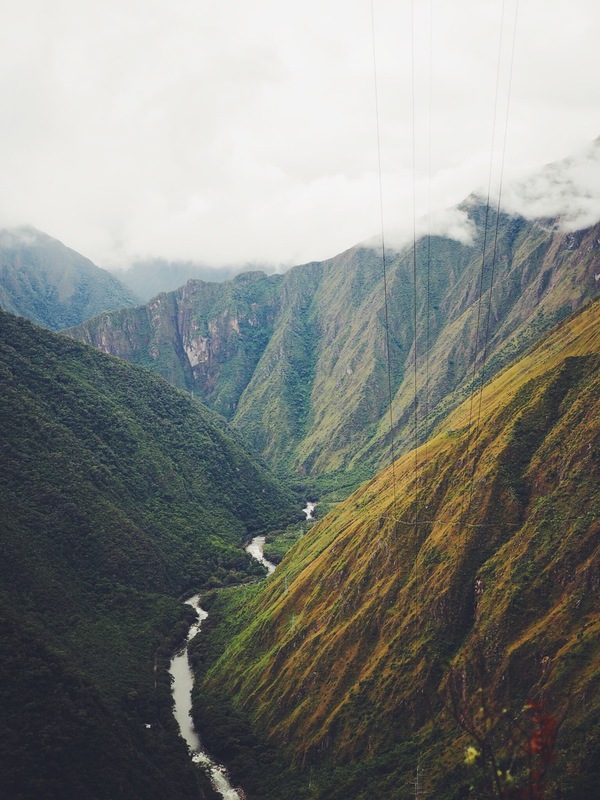 It was an impressive sight, particularly from the top, and as we descended down into the balconies we started to get a better sense of the scale of the site where inca farmers once worked. Around the corner from the main ruins was a second, older and more weathered looking version of Moray that looked like a practice version of the more modern ruins. After around half an hour of exploring we jumped back into our taxi (waking up our driver who was having a nap!) and continued on our way. We continued in our taxi through the hills, with our driver beeping away as he sped around blind corners as if his life depended on it! Thankfully we arrived in one piece to the Salinas de Maras, a huge salt mine carved into the side of the mountain that was once used by the Incas to obtain salt using evaporation pools. We had to pay a small fee to enter, but it was more than worth it. Our taxi driver dropped us off and we headed down the short path until we could see the expansive series of stepped salt pools. All the pools were different shades of white, brown and orange due to the salt quantities and minerals in each, and we could actually walk down through them, passing along the ancient subterranean stream that had been built to supply salt water to each pool. We found a few locals working amongst the mines; rebuilding and strengthening the walls of the pools. It was a fantastic and surreal sight, and we were really glad we'd made the stop off. 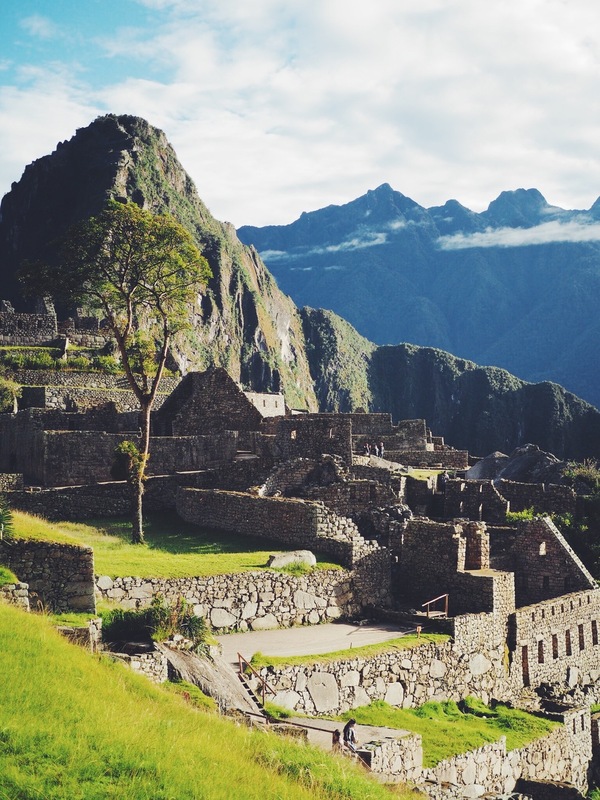 Ever since leaving for South America in January, Machu Picchu had been top of our list of places we wanted to see. Despite the hype, being a very touristy destination and a bit of rain, we found it to be just as special as we were hoping. Cusco was definitely the prettiest city we’d been to, with beautiful Colonial architecture, great cuisine and a decent nightlife making it a perfect stop-off for the 3 of us before our trek. The sacred valley was something we hadn’t planned on visiting before we left, but was a great added bonus when heading back to Cusco from Machu Picchu. Although it was sad to say bye to our friend Tom, we left Cusco feeling both content and exited for what the rest of Peru had in store. Our final stop in Bolivia was Lake Titicaca, the highest navigable lake in the world set at 3,800 meters above sea level. Home to a number of beautiful islands with breathtaking scenery, trekking opportunities and a chance to meet the local communities inhabiting them, it was a place we were very much looking forward to exploring. From La Paz we took a ‘Collectivo’ (a cheap minivan that takes groups of around 12) that wound through the mountains of northern Bolivia, and after a short ferry crossing we arrived at the lakeside city of Copacabana. 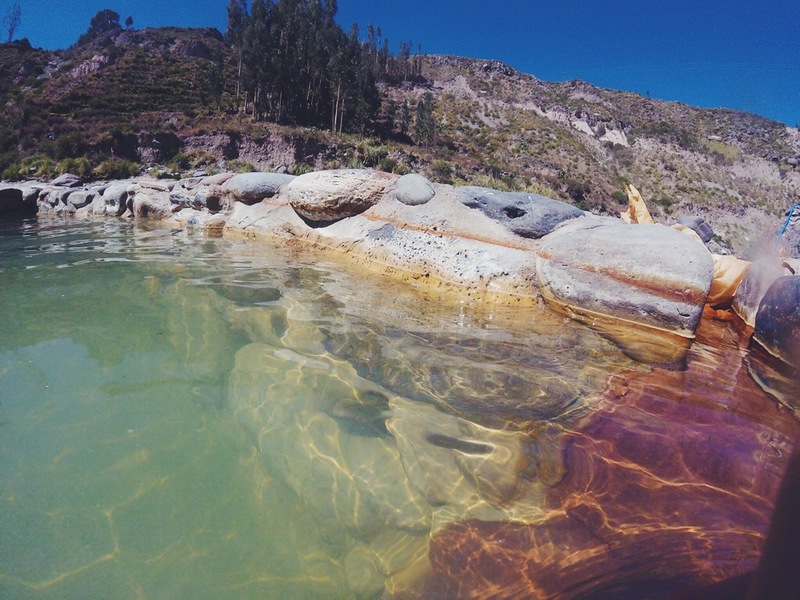 Copacabana is a small, picturesque city situated on the south of Lake Titicaca, nestled amongst two mountains and with a long, thin beach lining the waters edge. It is also the main city from which to explore the beautiful Isla Del Sol, or Island of the Sun. We arrived late afternoon and settled into Hostal Florencia, which was fairly basic but good value, and boasted a great view of the Basilica de Nuestra Señora de Copacabana. 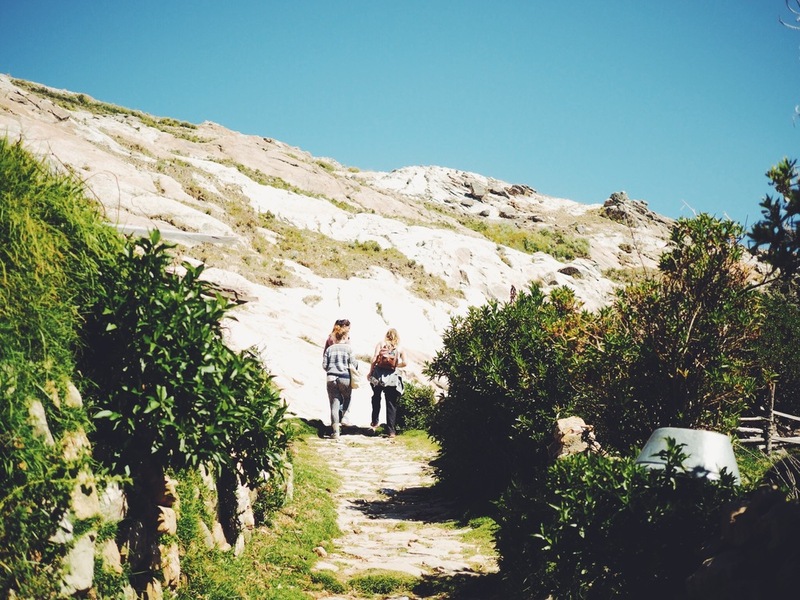 We decided to visit the famous Cerro Calvario hilltop to get the best view of Copacabana. Feeling adventurous we took the 'off road' path which, retrospectively, wasn't a wise choice as we weren't feeling 100% due to the altitude. Although short, the hike was steep and challenging, but after a lot of panting and feeling faint we finally reached the top. We were greeted with an amazing view of the entire city; it was definitely worth the effort. It was great to get an idea of the sheer size of Lake Titicaca from above, a mass of water that spans over 8,000km. We spent half an hour or so at the top to catch our breath before taking the much easier and gentler route down via the stone steps on the other side, leading us back down to the city square. We then visited the main landmark of city, the ‘Basilica de Nuestra Señora de Copacabana’. We’d seen quite a few colonial churches whilst travelling South America, but this one stood out with a strikingly colourful ceiling inside, painted in reds, blues and yellows (quite rare for a catholic church!). After walking around the courtyard and taking in the beautiful interior we headed back to our hostel for a rest after an altitude-intense day! 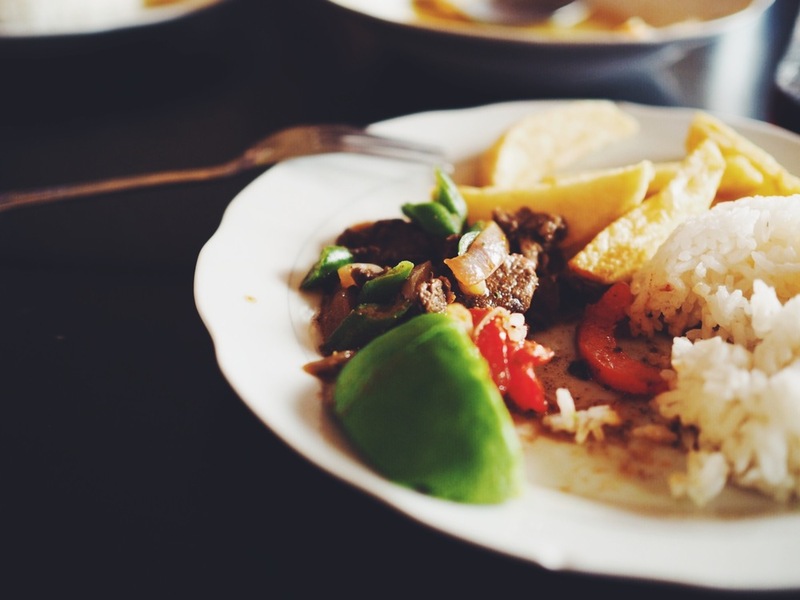 We had read great reviews about the food at Hostal La Cúpula, so that evening decided to pay it a visit. As it was so popular, we had to wait a while on their outside terrace for a table, and although it was pretty chilly out we loved taking the interesting architecture and bespoke design features. We ordered the freshly grilled trout (famous in Lake Titicaca) with native vegetables, which was delicious. By chance we saw a Welsh couple that we had previously met in La Paz, so once finished they invited us to their table and we spent the evening exchanging tales and swapping travel tips. We took their advice and booked into a hot tub next to the restaurant, and spent an hour watching the stars from our own private hill top pool. The next morning we were up early to pack our light day bags, and boarded the 8.30am ferry to the north side of our first island visit in Lake Titicaca: Isla del Sol. The journey was slower that we were initially told (taking around 3 hours) which was a bit tedious, but on board was a girl we had previously met in Florianopolis, so we passed the time catching up on our travels since we had left Brazil. 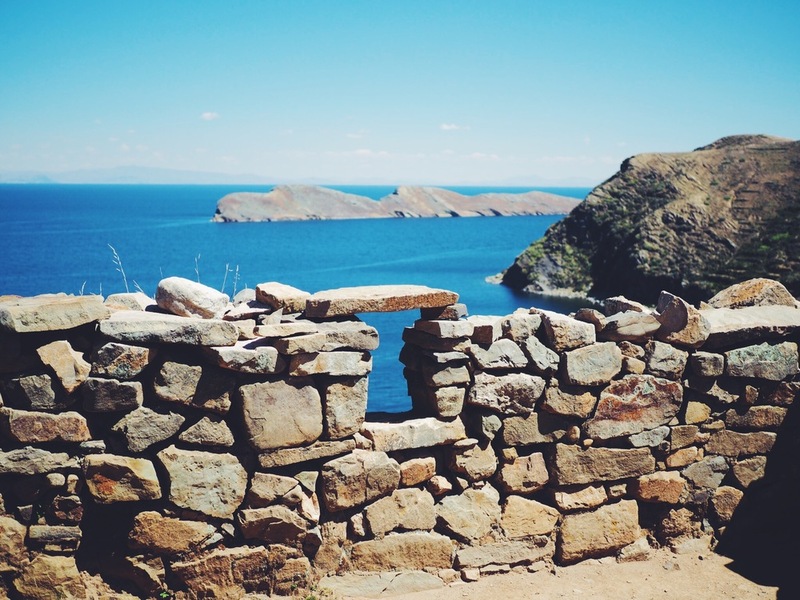 The weather was perfect for hiking, and as we pulled into the docks we started to see the beautiful rugged landscapes of Isla del Sol. After landing and buying an entrance ticket we set off with a small group of others to trek from the north to the south side of the island. Along the way we were treated to views of crystal clear waters, green mountains and beautiful white beaches. The air temperature and water were colder than it looked due to the altitude, but once we got going it was perfect hiking weather. We reached the look out point to get some photos of the view, and visited the Palacio del Inca ruins, a maze of stone walls also known as the Labyrinth. We also saw the Titi Qala, or Mountain Cat Stone, a large outcrop with a crag where at sun rise the sun shines right through. The Incas believed that this was the birthplace of the sun, hence the name Isla del Sol, and was therefore a frequent pilgrimage destination for the Incas. We then continued onwards uphill towards the south side of the island. Our travel companions we're catching the 4pm ferry home, so once we reached the south side, they had to race down to try and catch the boat before it left. Luckily we had decided to spend the night on the island, and so checked into a hostel that we had researched the day before. The hostel was very quiet, and there was a lovely Cholita host who led us up to the top floor room that boasted amazing views over the lake. We wanted to finish the hike so we headed down the steep steps (Escalera del Inca) towards the harbour, walking past the gently flowing Inca stream and taking in the small southern village of Yumani. We then shared a cheap lunch on a water-side restaurant watching the local girls loading up donkeys with supplies. 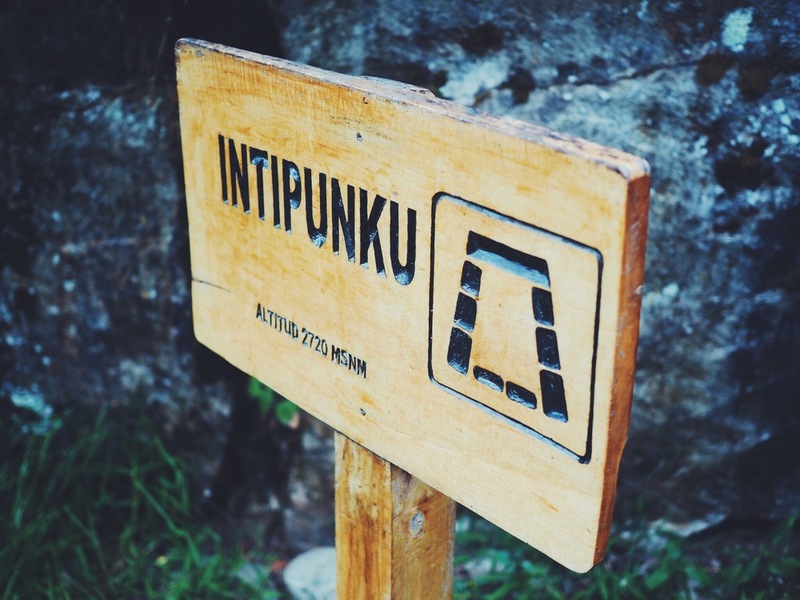 As our hostel had an amazing location situated at the top of the island it mean we had to take the steep path back up to the top, which was pretty tiring after a full day of trekking. 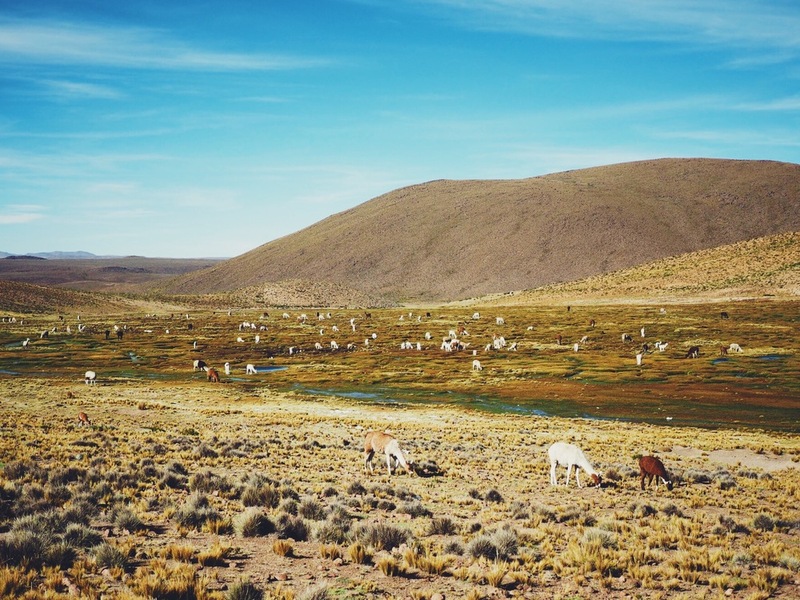 There were no roads or cars on Isla del Sol, only cobbled paths, and as we continued we started to get out of breath it became clear how vital the donkeys were for carrying produce up and down the steep hills. 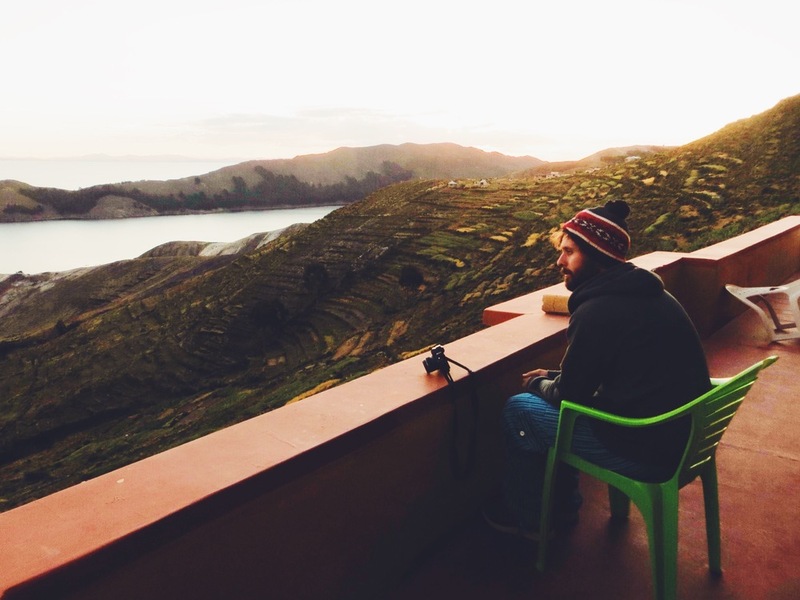 We reached our hostel just before sunset, wrapped ourselves up in a warm blanket and watched the sun set over the amazing Lake Titicaca. It was that moment we fell in love with the island; there was barely a sound apart from the occasional disgruntled Mule, and there was not a person in sight as we watched the sky turn orange over the tranquil turquoise water. We were keen to visit the best restaurant on the island, Las Velas (the candels), which was hidden in the nearby forest. After getting completely lost in the dark for over 20 minutes, we eventually found the small homestyle restaurant nestled amongst the trees. It was wonderfully rustic, and as the name suggested, was only lit by candle light with two 'gourmet chefs' in their simple domestic kitchen. After ordering we were given card games to play while we waited for our food, and we sampled a bottle of the local Bolivian wine, which was surprisingly good. We ordered the pizza and trout, which were both great, and as we were last to leave we enjoyed chatting to our cook afterwards. We headed back through the forest to our hostel under an amazingly starry sky with total silence around us. 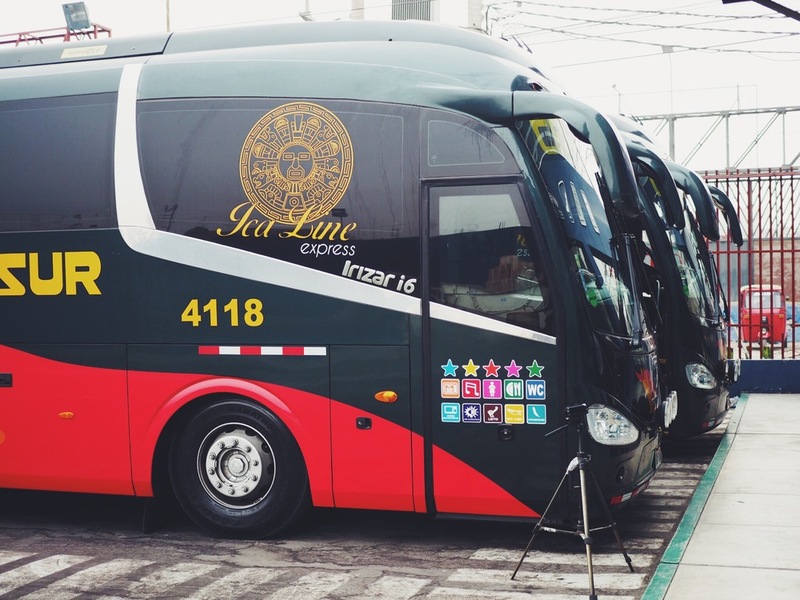 After a final night in Copacabana we took a cheap bus across the Peruvian border, aided by a lovely bus conductor who advised us to change our Bolivianos at the border for a very reasonable rate! We passed by green and gold fields and more stunning blue lake as we approached Puno, the first Peruvian city of our trip. Unfortunately, by the time we had arrived in Puno and checked into a hostel we realised that the food (we suspect the trout!) at the lovely Las Velas restaurant had given us dodgy stomachs, and so we had to spend a couple of days recovering, watching films and eating chicken noodle soup. We actually welcomed the down time, as it had been quite intense travel over the past few weeks. Puno itself isn't known for its sights, and is mainly used as a launch pad from which to visit the nearby islands, and so we were surprised to find a pretty square with a nice church. After scouting out various island tours we decided on the one offered by our hostel, and once everything was sorted we took the chance to relax for a few hours. That evening we went to Mojsa Restaurant, arguably one of the best in Puno, and got a balcony table overlooking the main square. We had excellently prepared Chimichurri steak and (fresh!) grilled trout with native vegetables, and after feeling well fed we headed back to the hostel to get a good nights rest before our trip to the islands. 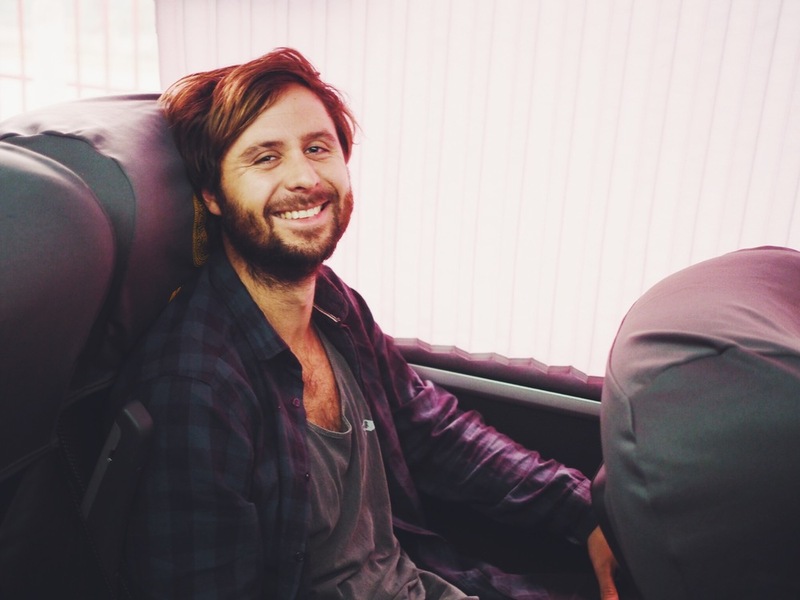 We were picked up from our hostel around 8am and headed in a cab to the docks to board our tour boat. Within half an hour of setting off we were surrounded by the intriguing floating islands of Uros. The islands themselves were constructed from the native totora reeds and were originally built so that they could be moved when under attack, mainly during the Spanish colonisation. Now-a-days there are 42 islands, all of which are still constructed in the traditional way. However, not all residents live permanently on these islands, and many of the locals use them as means of making money through tourism, making them feel a little less authentic than we originally thought. 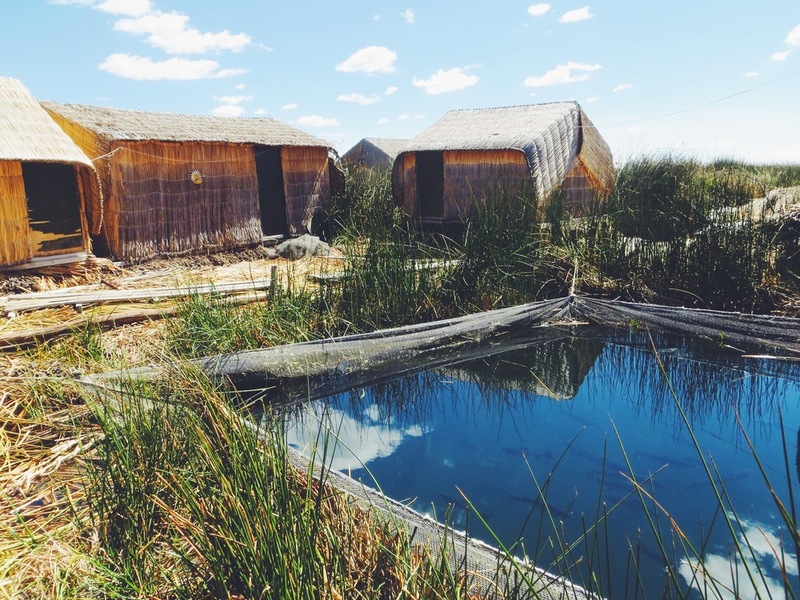 As we boarded the first floating island, it was very cool to feel the movement of the ground beneath our feet, and the traditional huts looked very quaint amongst the reeds. 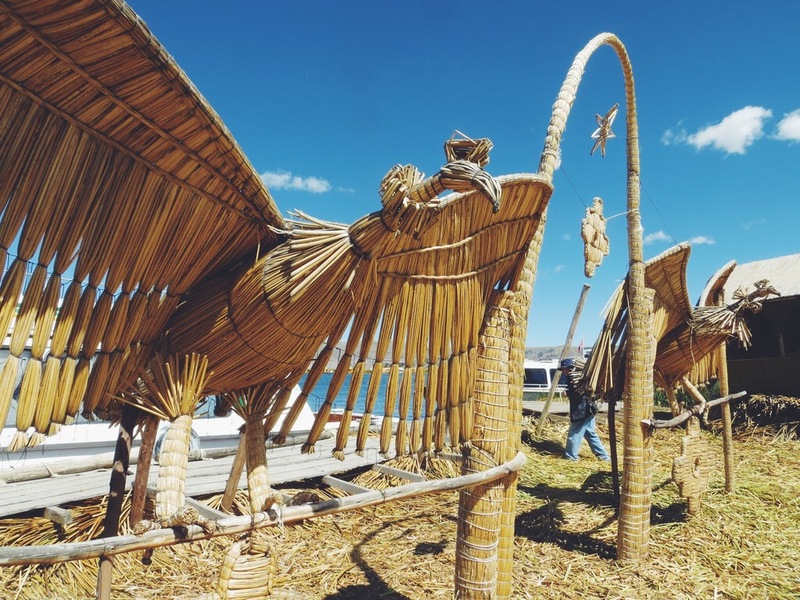 Our group were given a short but informative presentation on the construction of the islands, which we learnt was made by lashing together 2-meter-thick blocks of khili roots with eucalyptus rods, and placing criss-crossed layers of totora reeds on top. We were then split into small groups and taken into the little reeds huts owned by the locals. 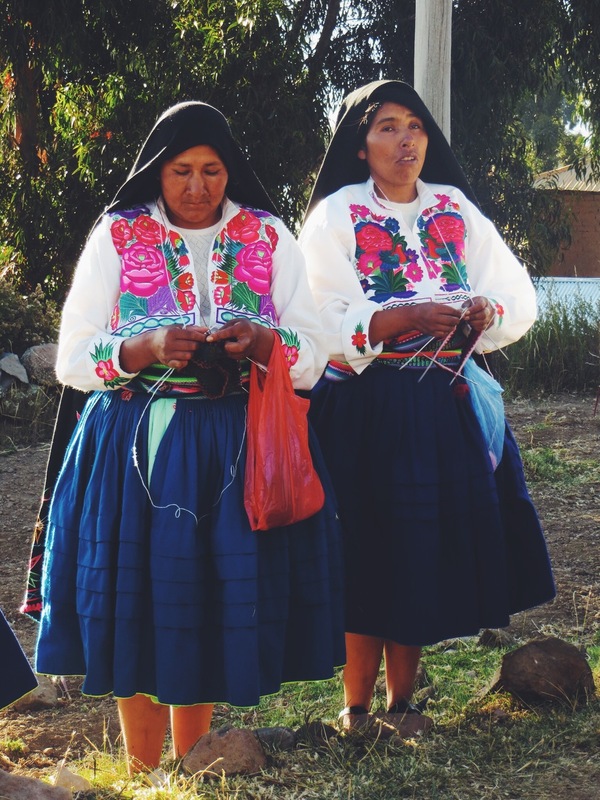 We asked the locals some questions about their life on Uros, although we realised the main purpose of entering the huts was to be sold textiles and other trinkets they had made. We decided not to buy anything, but offered a small tip to the locals instead. We then boarded a traditional reed boat (or ‘Mercedes Benz’ as the locals called them) for an extra few Soles, and sailed to the neighbouring island about 15 minutes away. The local kids began to sing different European songs to us for tips (a little gimmicky!) but it was fun to experience an age-old mode of transport none the less. As we reached the larger floating island we found there were small restaurants, reed archways, many trinket sellers, and even a very small trout farm in the centre. After exploring the second floating island we returned to the boat, and continued on our tour to the next stop, Amantaní island. We left feeling like Uros was a bit of 'tourist show', and it would have been nice to also see the current, more authentic lifestyle of the locals on the islands, regardless of what traditions had been lost. 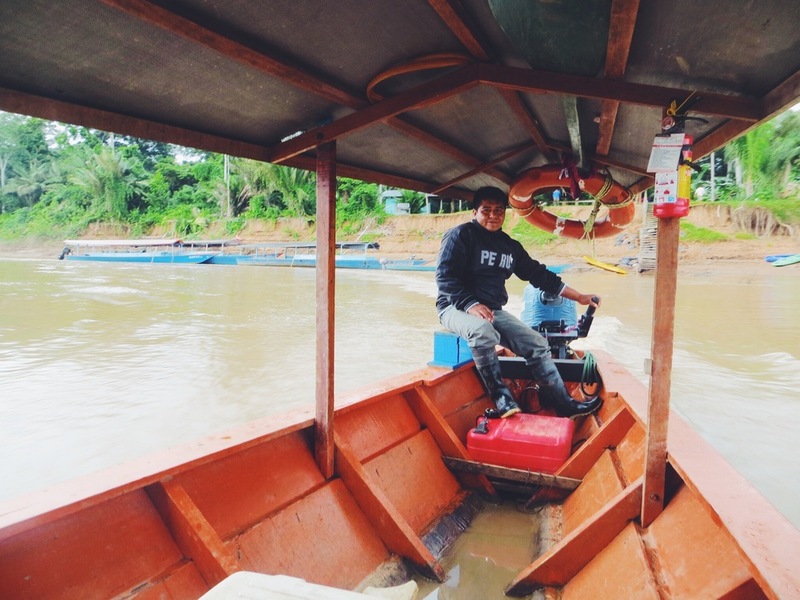 Overall the floating islands was an interesting experience for us, and we loved seeing the traditional methods used to make the boats, handicrafts and the islands themselves. Our next stop was Amantani island, a 2 hour boat ride from Uros. We pulled up to the island where a group of around 20 traditionally-dressed local women were waiting to take us to our separate home stays. After most of the groups were selected, we were introduced to a young girl called Seneda, who was only 14 years old. We assumed she was the daughter of our host, but after she led us up the hill to a humble but cosy house we realised she was going to be taking care of us for the next 2 days! After being shown our room, Seneda set about preparing our lunch, and we soon realised that she was more than capable of looking after two travellers by herself. Having never been in a 'home-stay' before we felt a little awkward being catered for, and so went down to the kitchen to offer to help. Our communication wasn't great (our Spanish is still rusty!) so she set us to work peeling potatoes to keep us busy. Without a peeler we were pretty slow, and after her laughing at our attempts she showed us her amazingly efficient knife-peeling technique. It was a simple but tasty lunch of soup, potatoes, veg and cheese, and after we had eaten all we could we were introduced to Senadas two younger brothers. The youngest, who was 3, was the happiest child we had ever met, and we spent a fun hour drawing, terrorising the guinea pigs (him not us! ), playing ball and swinging him around. It was great to be able to meet such a fun little character during our stay, especially as the language barrier wasn't an issue! Senada then led us up to the main path of the village to meet with the rest of the group and hike to the Centro Ceremonial Pachatata ruins to watch the sunset. As we waited for the other members of our group we watched the herds of sheep pass, shepherded by the local girls, and once all assembled we started to hike to the highest point of the island. 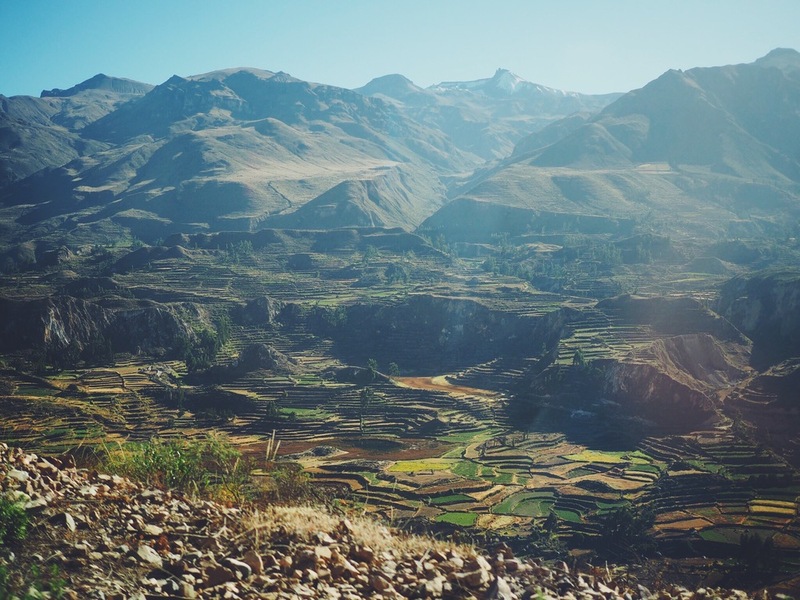 It was an easy-going trek that snaked up an old stone path, passing inca-style terracing and farmland, and by the time we reached the top we bought a lovely alpaca wool scarf from a local woman, found a comfortable spot and waited for the sun to go down. 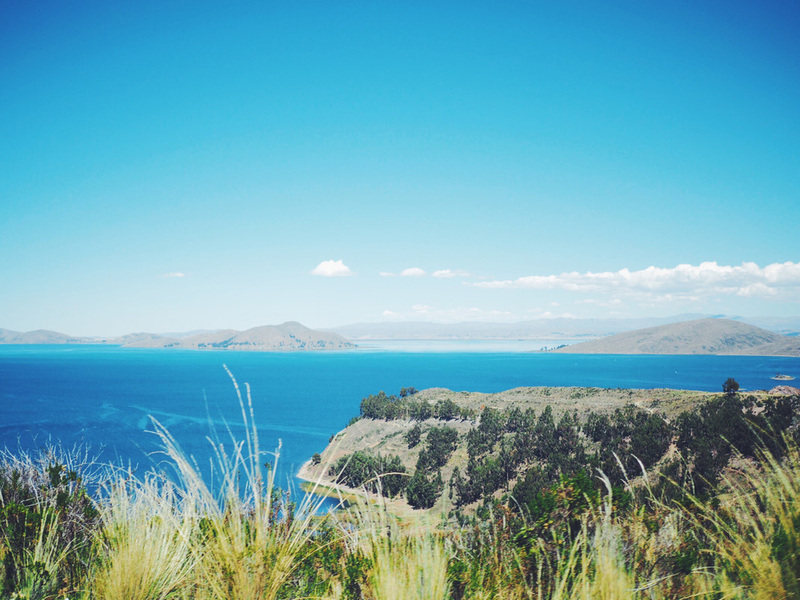 Lake Titicaca is sometimes referred to as the 'silver lake' due to the metallic sheen effect created by the sun, and from the hilltop we understood why it got its name. It was another beautiful sunset and great view showing off the ever impressive expanse of water. Once it started to get dark we headed back down to our little home for dinner, and were told we needed to get changed into traditional clothing for a small party that evening! It was fun being dressed in their hats and ponchos, even though we felt a bit ridiculous, but as we walked in the pitch black to the local village hall, thankfully we realised all the other tourists were dressed the same. We then spent a slightly awkward hour attempting to follow the Peruvian dance moves to a very repetitive local band. Fortunately the dancing didn't last long and after a little while of chatting to other travellers in colourful hats, frocks and ponchos we headed back for bed. The following day Senada was up early to make us breakfast, and by the time we were up and ready her grandmother and mother had arrived at the house. After meeting her mother we were really pleased that Senada had been our host, as we doubt we would have had as much fun if her mother had been looking after us. After our goodbyes, and big hugs from Senada’s youngest brother we were led back to the harbour and waited for the boat to pick us up. 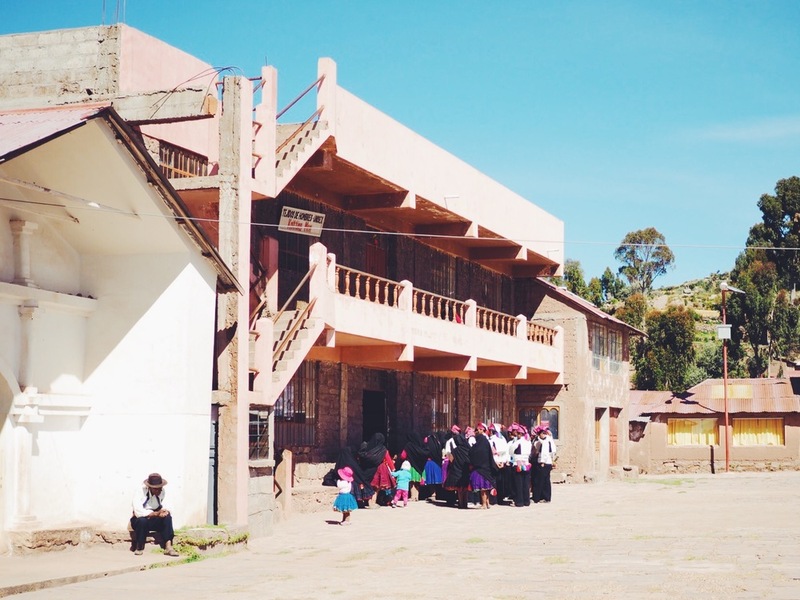 After leaving Amantani we headed to our final stop, Taquille Island. On the journey there our guide explained the differences in the clothing between the island's residents; on Taquille the women wore black dresses with colourful embroidery, and the men wore colourful hats with pom moms (the larger pom moms indicated a single man, smaller pom pom indicated married). Our guide also explained how the men of the island wore intricately hand-woven belts by their wives, with embroidery communicating the story of how they met, and actual hair of the woman interwoven into the fabric. On arrival we started to see the locals in their traditional clothing dotted around the island, and after a short hike to the top of the hill we wandered around the market stalls in the main square. We then continued to a small hillside restaurant where we were given a short demonstration of the how the locals extracted soap from the native plants, and used it to turn brown alpaca fibres used in many of their textiles to a brilliant white. After the demonstration we ordered from the lunch menu, chatted to the other tour members and basked in the sun until it was time to leave. Once we got back in the boat we dozed off during the 3 hour journey. We were woken abruptly about 10 minutes from Puno as the steering of the boat had broken, resulting in us crashing into the side of a floating island! It took a little while to correct our positioning, and the captain had to use long poles to push us away from the bank, before using the back rudder to steer us safely back to Puno. 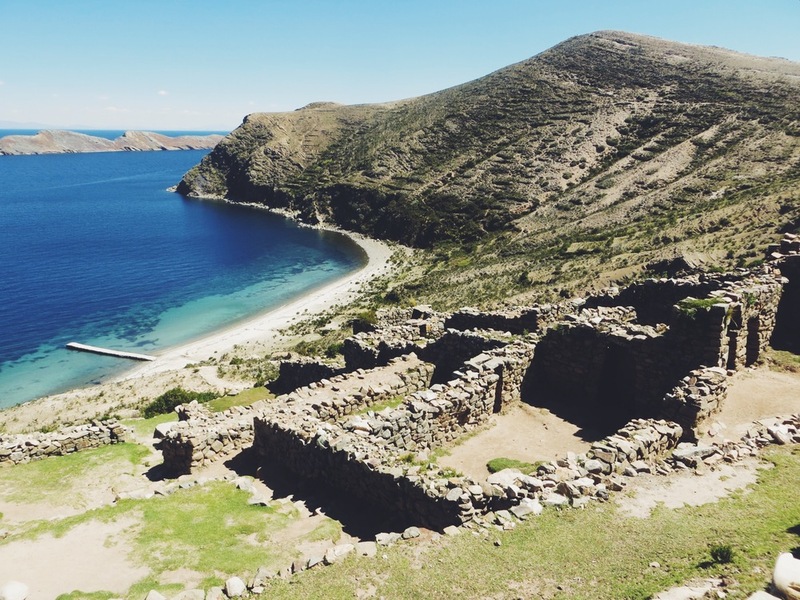 The scenery, traditions and local people of Lake Titicaca were pretty much unknown to us before we set off on our trip, but after visiting both the Bolivian and Peruvian sides of the lake we were so glad we had included it in our itinerary. 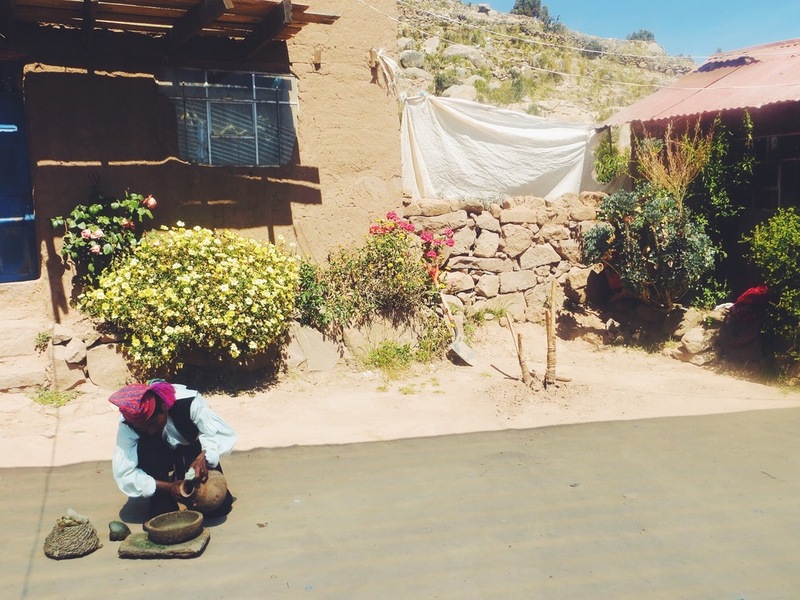 From hiking through the peaceful Isla del Sol to floating on the reeds of Uros, making ourselves at home with a local family on Anamtani island to seeing the traditional clothing of the locals on Taquille, our visit was both varied and rewarding in terms of landscapes and culture. 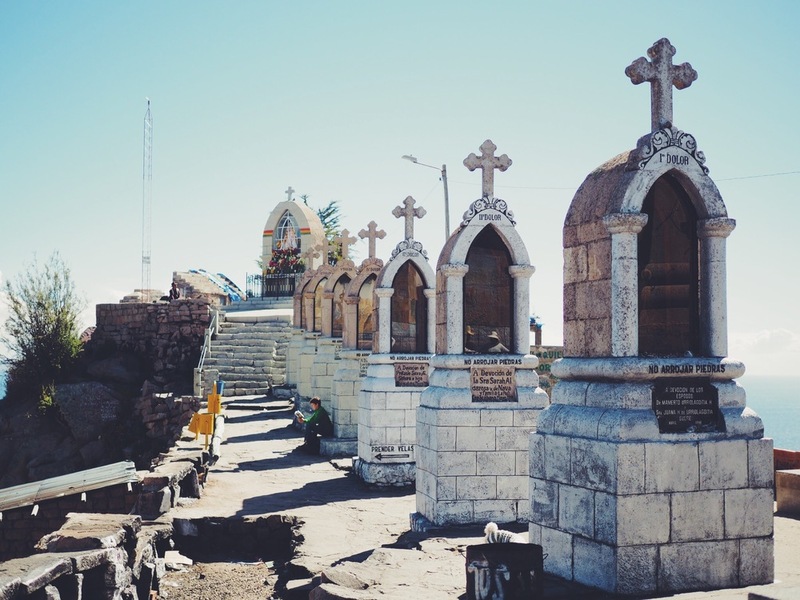 Our next stop was Cusco, and it was satisfying to leave Puno with an initial understanding of Peruvian culture before our trip to the ever popular Machu Picchu.